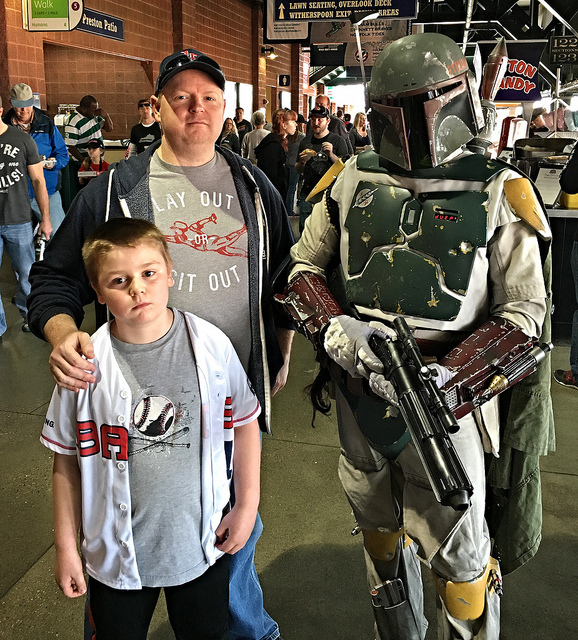 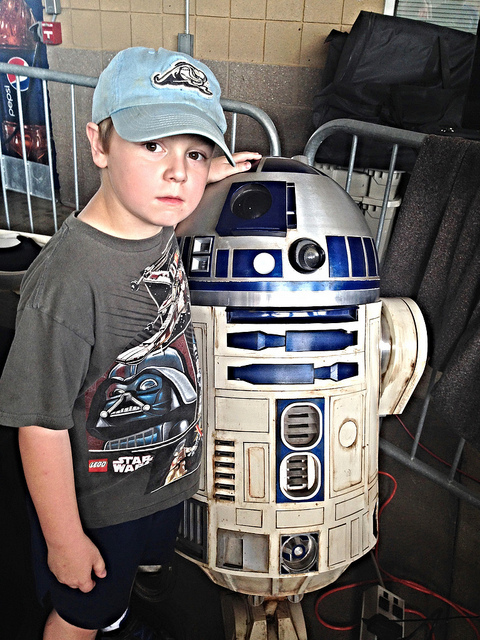 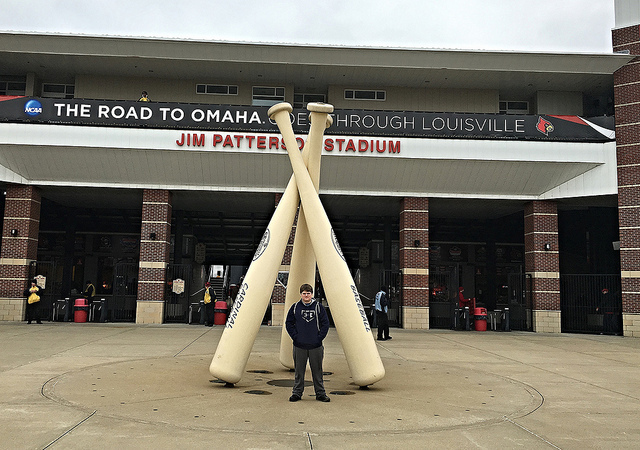 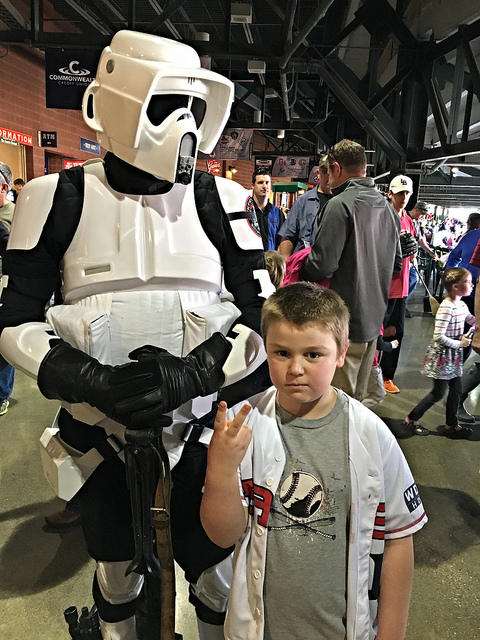 Louisville Slugger Field-Louisville, KY: It’s that time of the year again, and a change in venue couldn’t keep me from taking my scruffy-looking nerf-herders to Star Wars night. 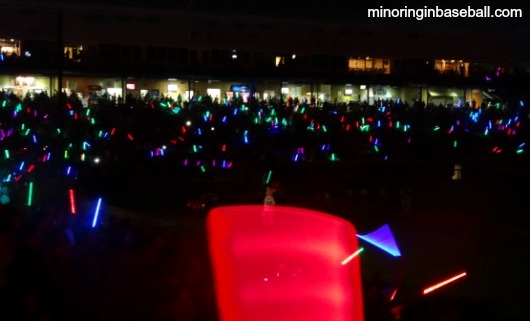 This year is our first here in Louisville, and they put on a pretty good show for the kids. 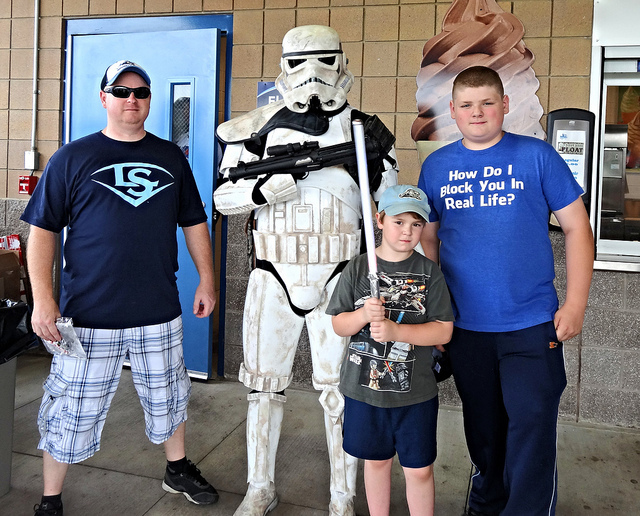 Due to an accident on the freeway, we got to the game about a half hour late, so Brian missed out on his free light-saber (not that he doesn’t have an arsenal of them at home..). 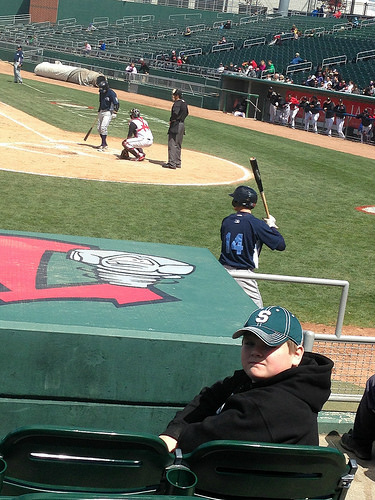 But, the weather was perfect, and my friend Darryl visiting from Ohio got us great seats behind the first base dugout. 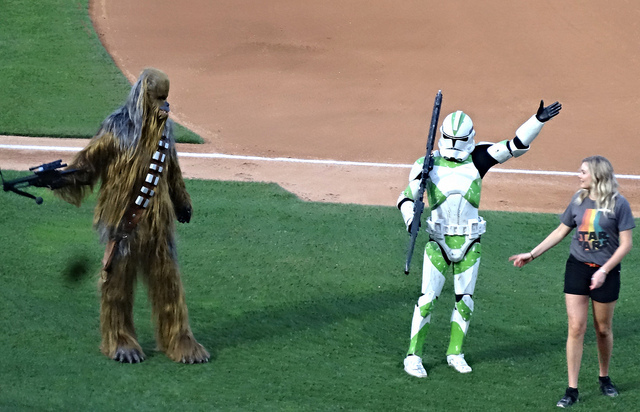 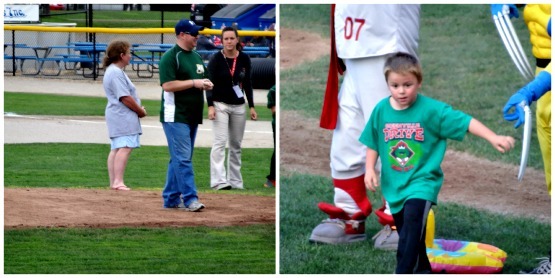 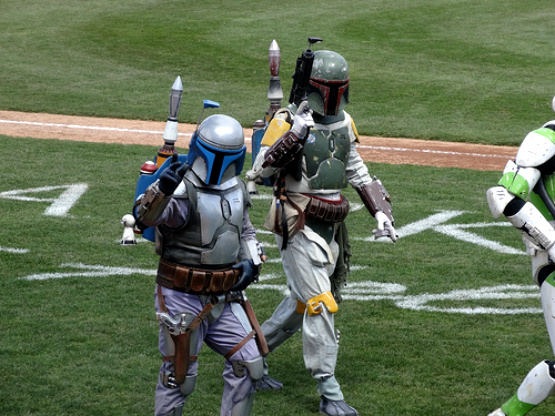 They had the Star Wars characters on the field before the game, and throwing out some first pitches. 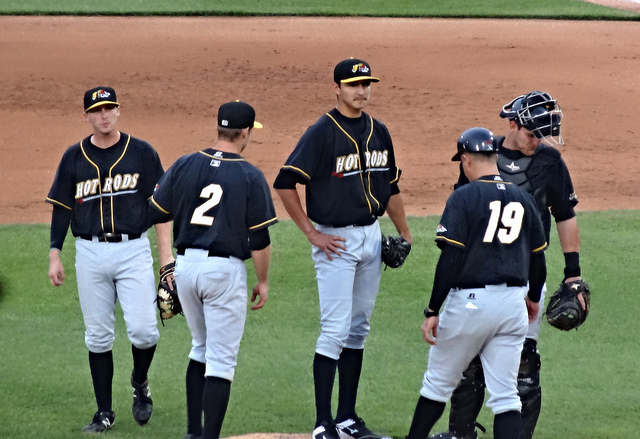 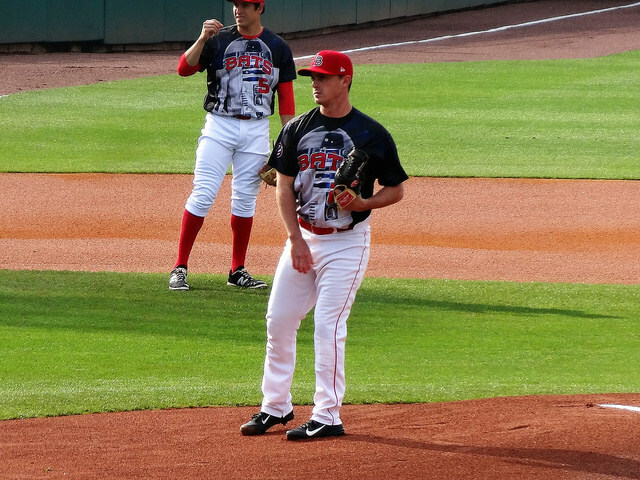 We watched a few innings of the game, which turned out to be a pitchers duel, sort of… Chad Rogers got the start for the Bats, and he ended up pitching four shut-out innings. 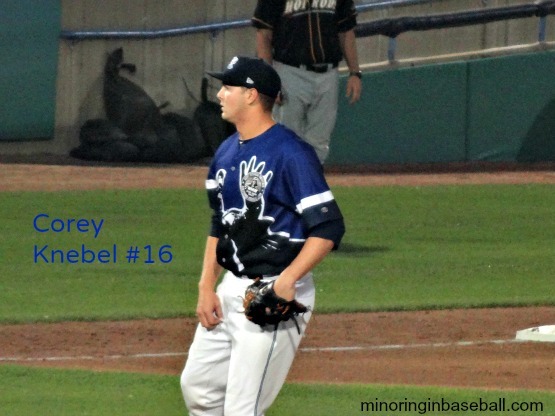 He gave up only five hits on the night, while walking two, and striking out three. 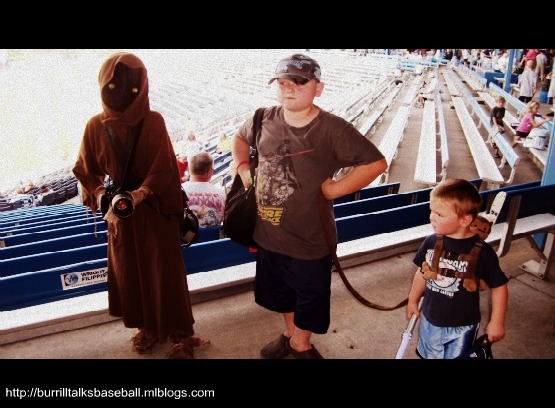 When the Star Wars characters started making their way to the concourse, the boys and I decided to join them. 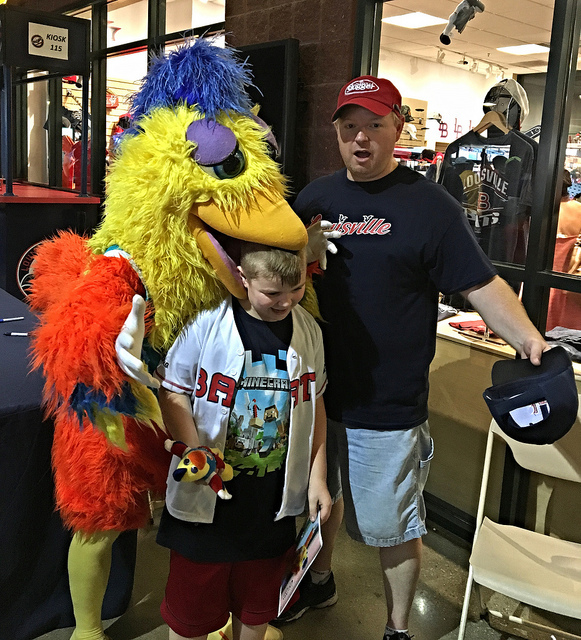 First of all, Brian was really happy just to finally meet the Bat’s mascot, Buddy Bat! 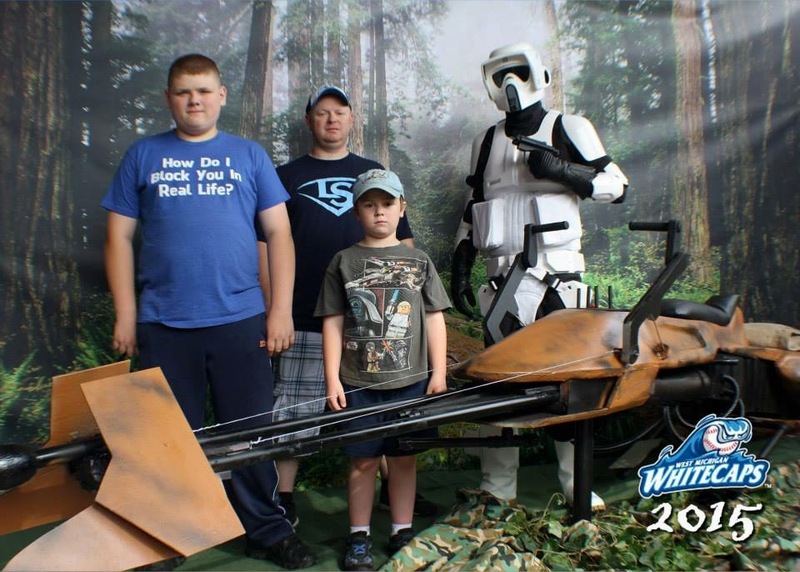 We then were able to see some of the Star Wars guys, with Brian getting in with an Imperial Speeder Bike Trooper, and Trevor and I were happy to see Boba Fett, who is our favorite and we missed him last year. 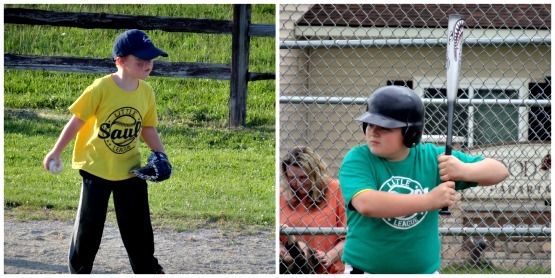 Back to the game. 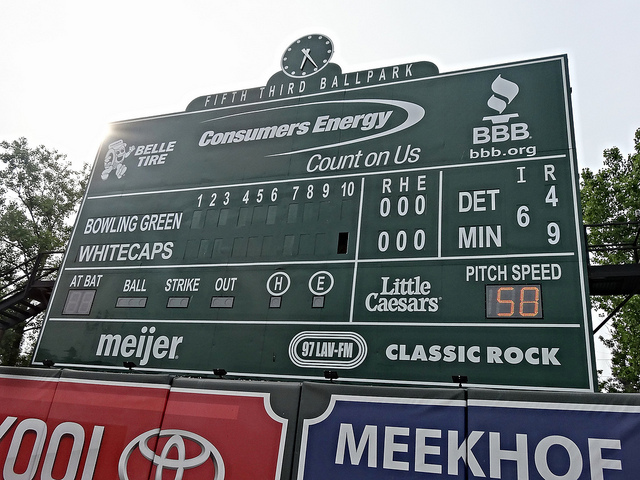 A 0-0 tie doesn’t sound all that exciting, but this was a great game to watch. 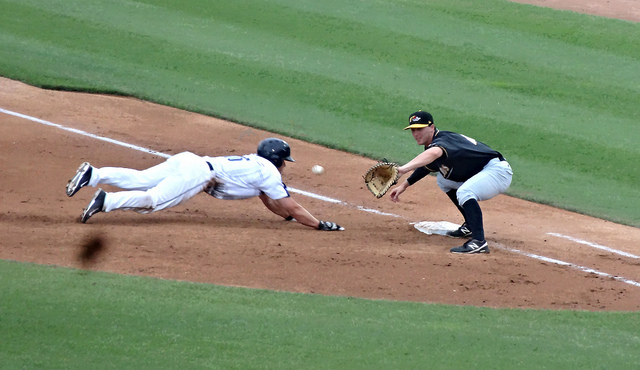 Both teams had runners in scoring position multiple times without being able to push a run home. 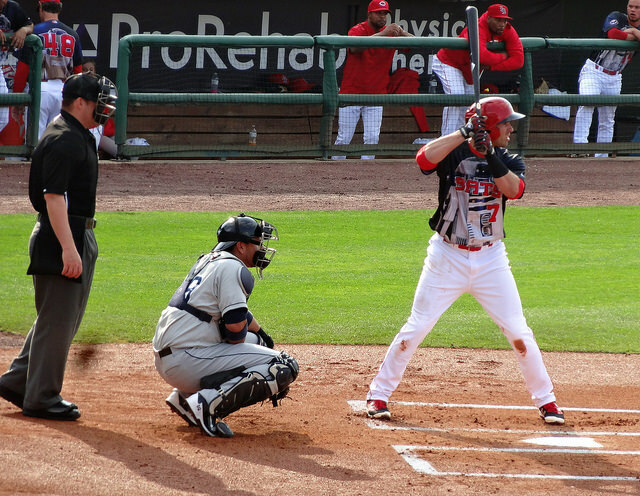 Louisville actually had the bases loaded with no outs in the sixth, and were unable to score. 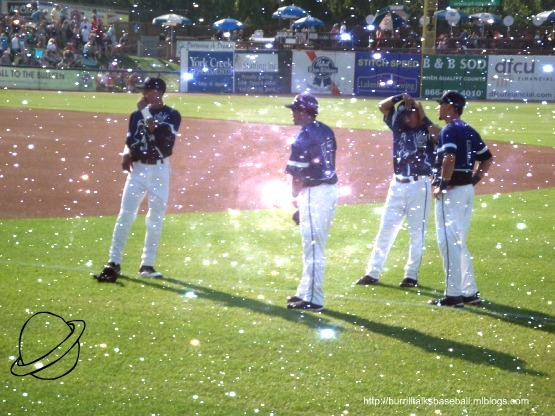 Pair that with a gorgeous night for baseball, and we didn’t mind at all going into extra innings! 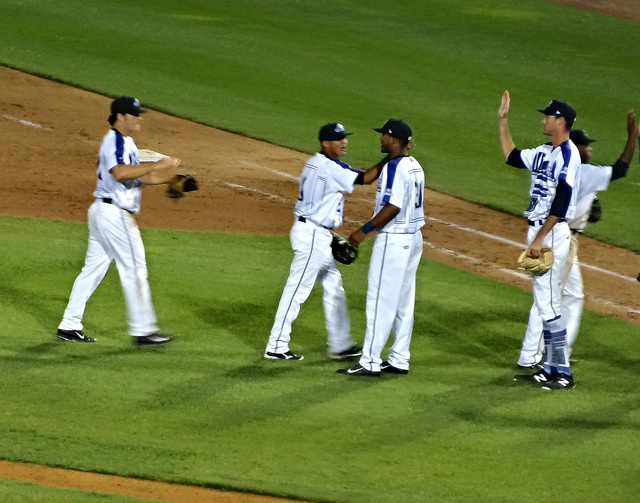 The game finally came to an end in the 11th, when Seth Mejias-Brean smacked a two-run homer to win the game and send the crowd home happy. 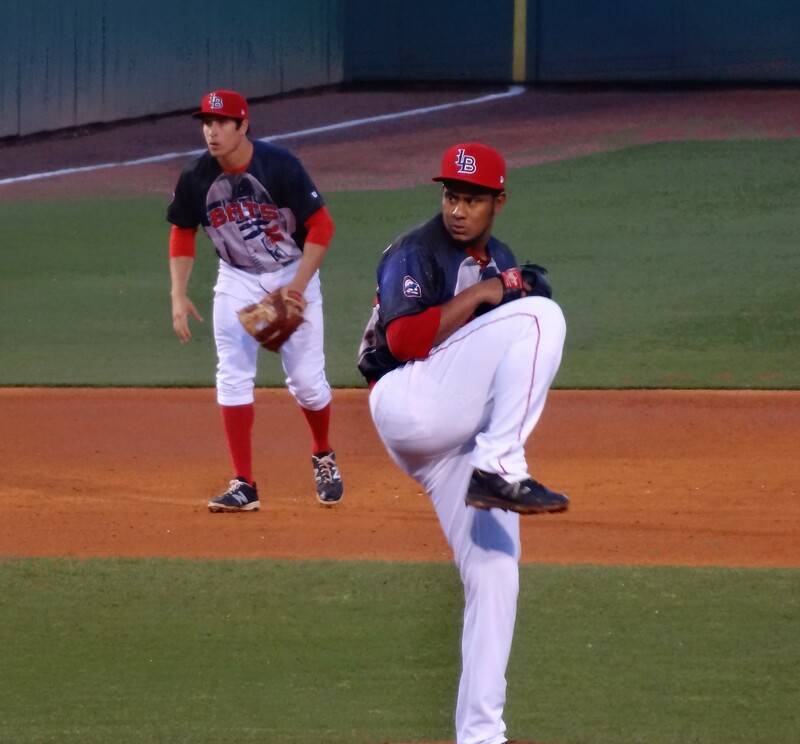 Relief pitcher Wandy Peralta picked up his first win of the season, and Kyle Waldrop added a pair of doubles in the game. 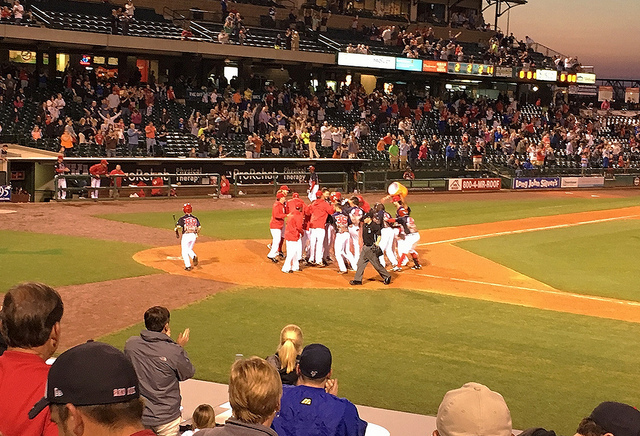 FINAL: Louisville 2, Clippers 0, 11 innings. 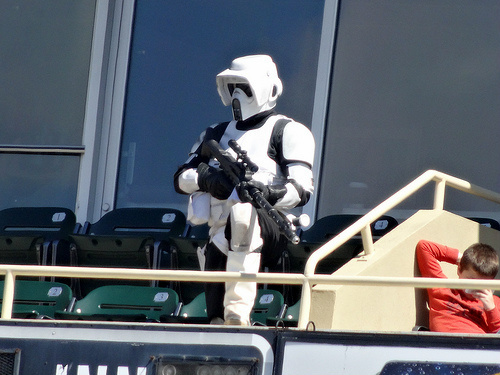 This game was as much fun at a ballgame that I’ve had in some time. 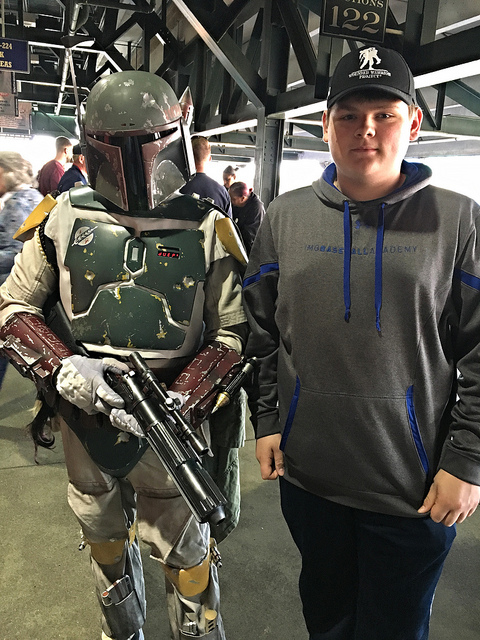 It was a great time spent with the boys and my best friend, and it’s always good to be surrounded by other knowledgeable baseball fans. 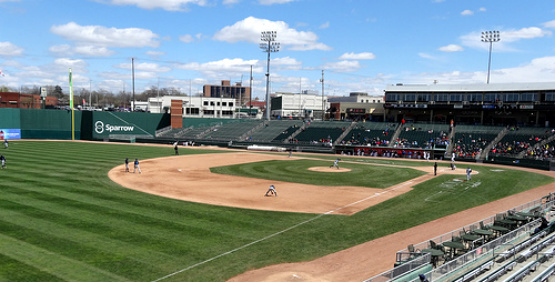 If the weather could be like this every game, I would be more than happy. 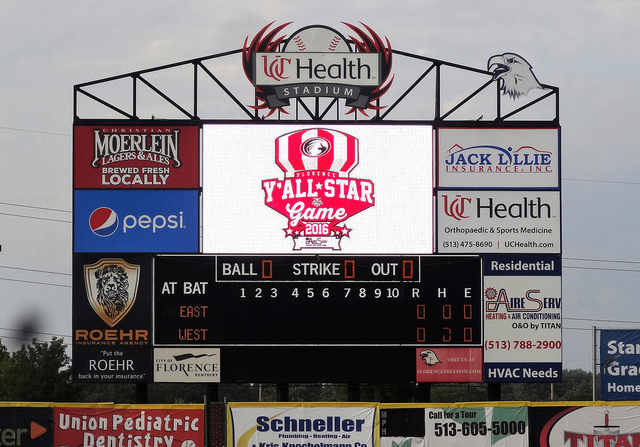 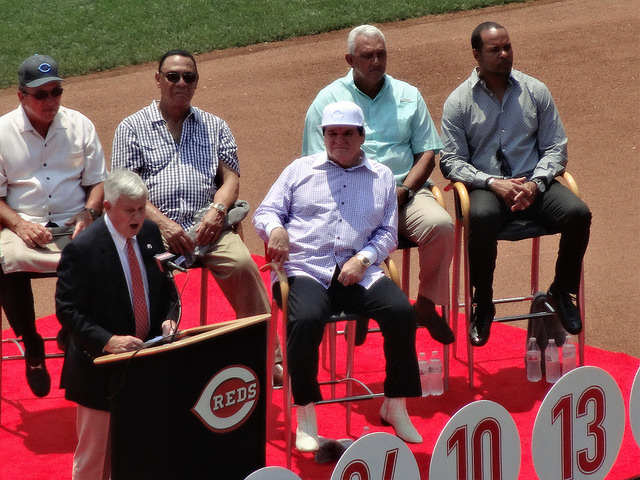 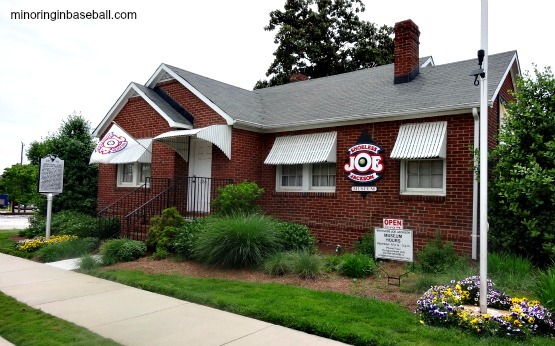 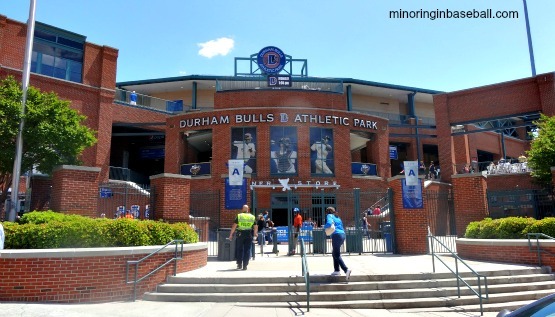 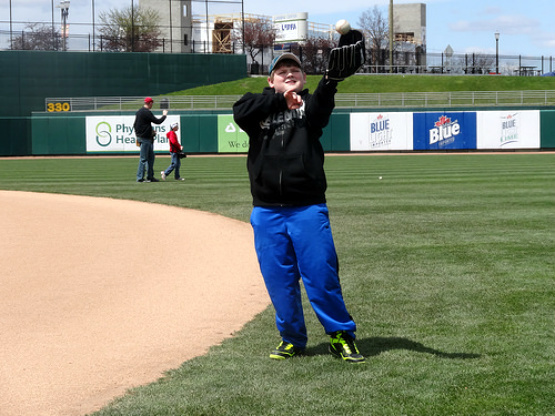 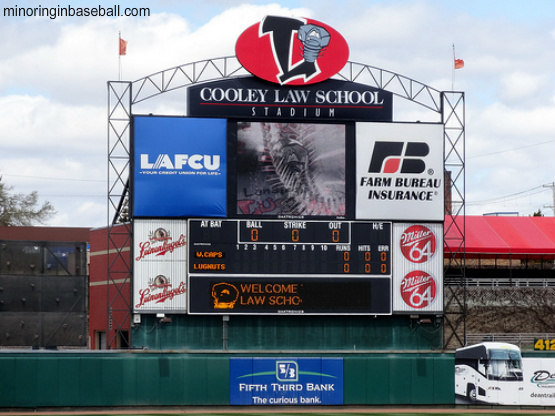 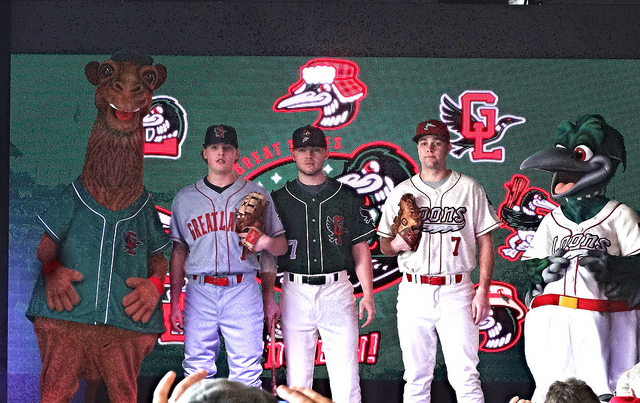 I’m sure we’ll be making another trip to Louisville Slugger Field, too, and to some other teams in the area. 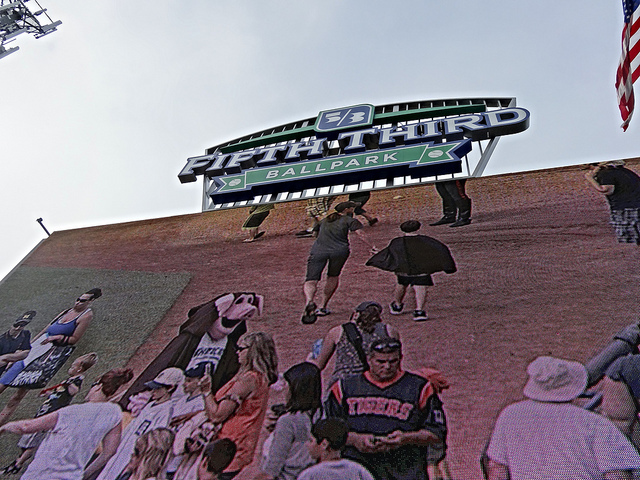 I did remember to take a quick video, too, hoping the Bats would win it in the ninth. 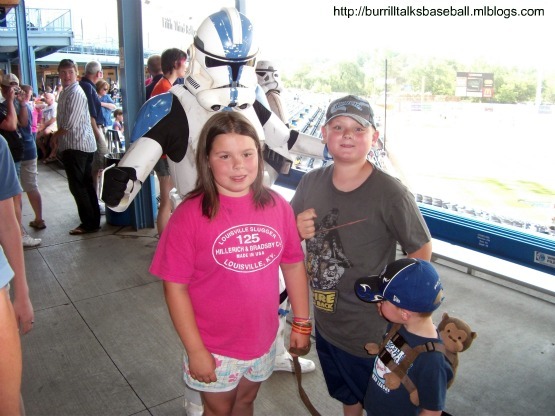 Brian and Lily with Beach Bums mascot Sunburn! 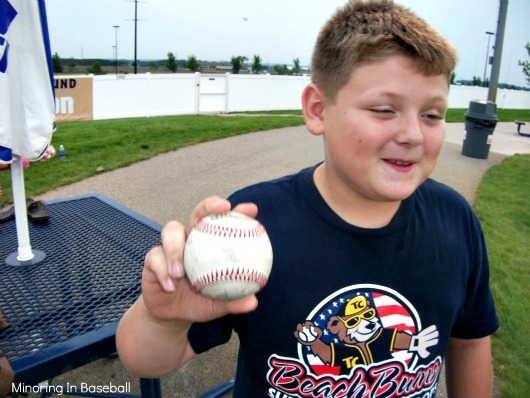 Believe it or not, this is the first ball we’ve gotten at a Beach Bums game, and our first Frontier League ball. 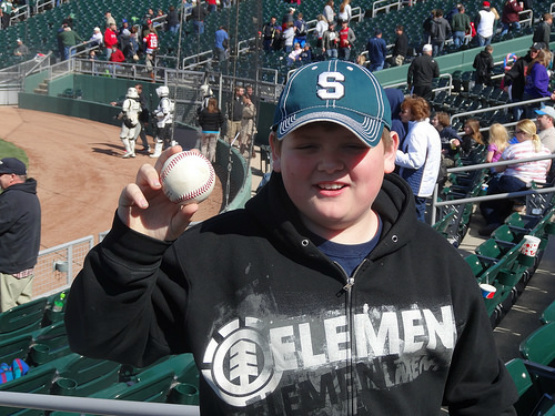 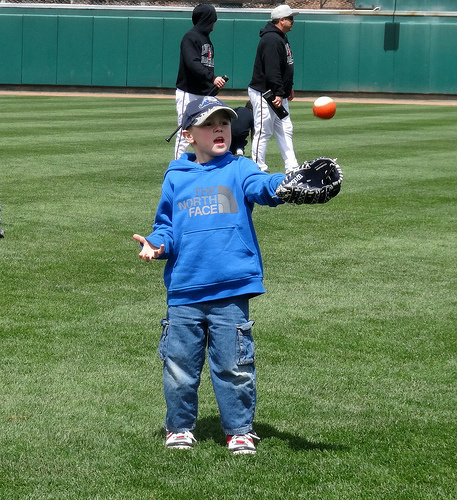 Trevor was lucky to get this foul ball. 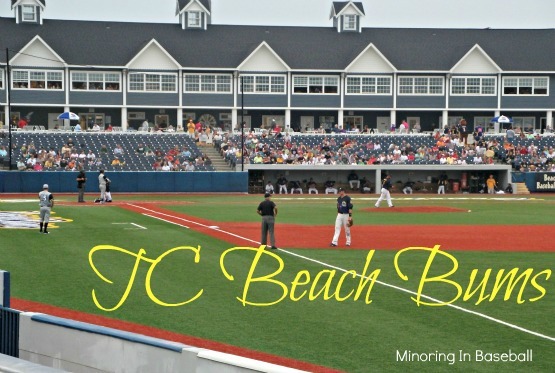 A trip to Traverse City wouldn’t be complete without a stop at the Pirate’s Cove. 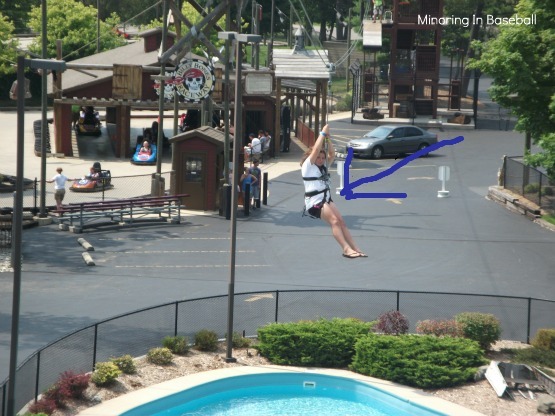 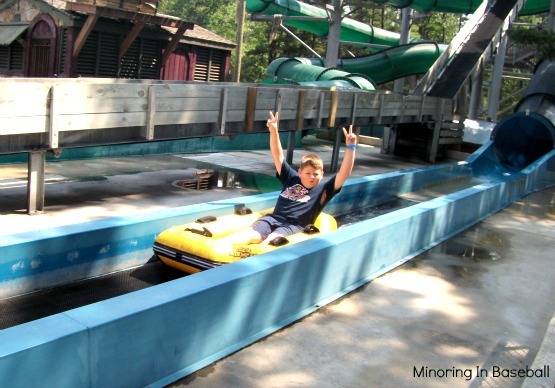 It was a beautiful day out, and the kids and I were lucky enough to spend it doing the zip line, bumper boats, go-karting, and the water coaster. 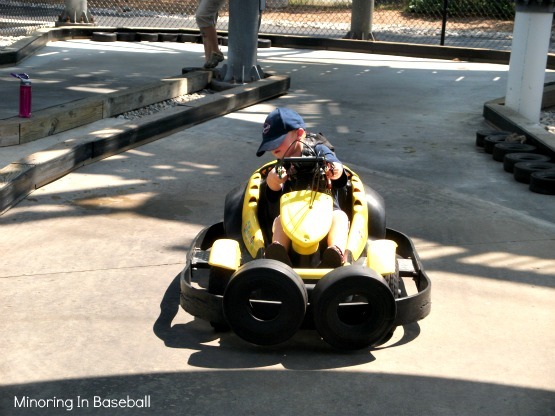 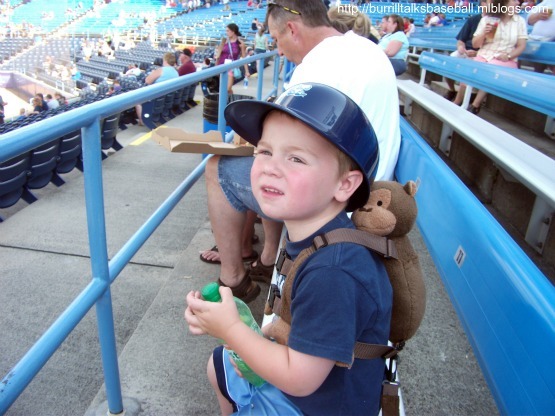 I had to fudge Brian’s age a little so he could drive his own kiddie kart, but he did a great job, and is actually a better driver than his mom… Anyway, this was a great day, a day spent with family (we met Papa and Nana at the ballgame) and fun, and one you feel very lucky to have had. 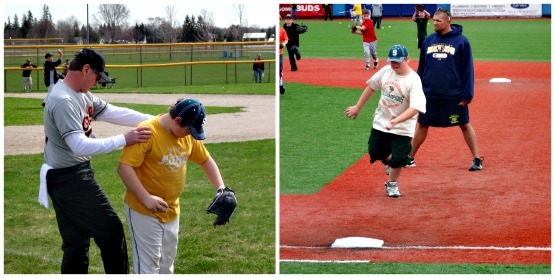 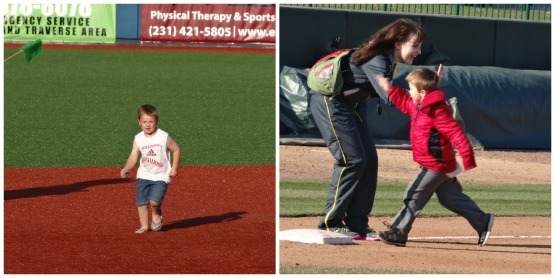 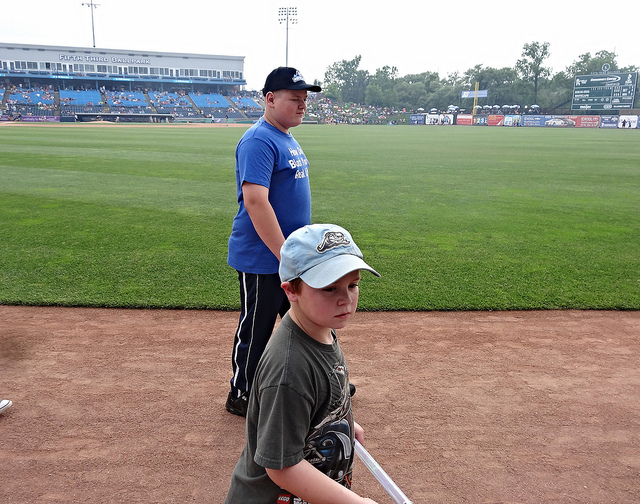 I feel lucky to be able to do this for my kids, and hope we can take in at least one more game before school starts. 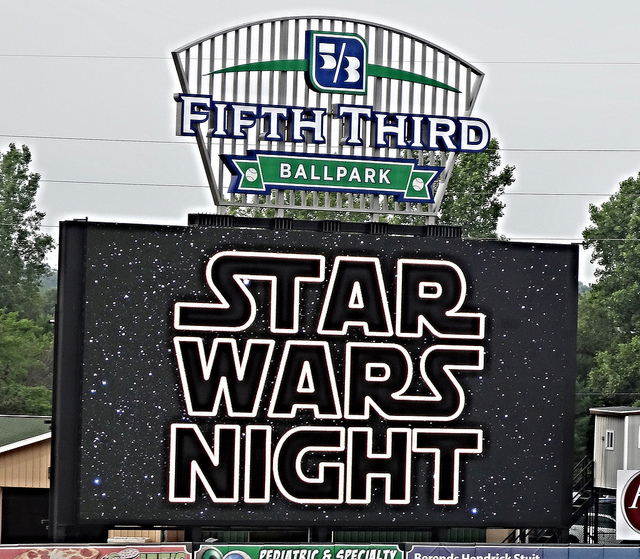 Our favorite game of the year is Star Wars night for sure. 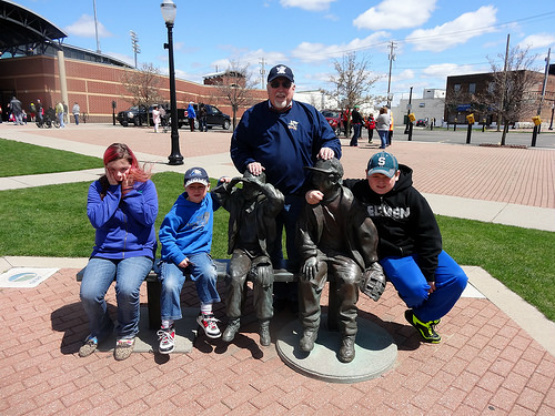 This time we brought Brian down for the fun, too. 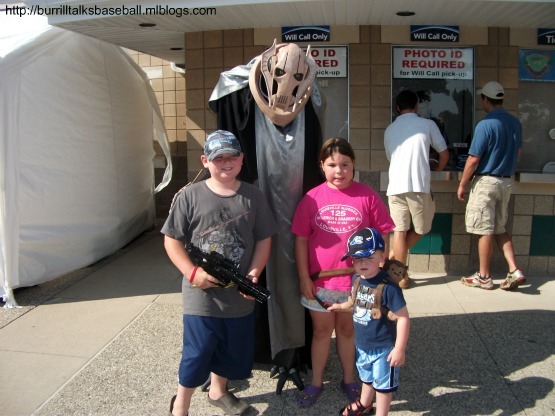 It was a beautifull night for baseball, but the real thrill for the kids was seeing all of their favorite movie characters. 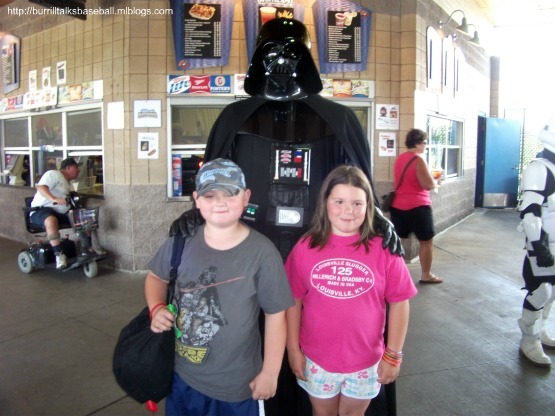 Me being a Star Wars freak since I was like, five, they’ve been exposed to the movies (original trilogy) for a number of years. 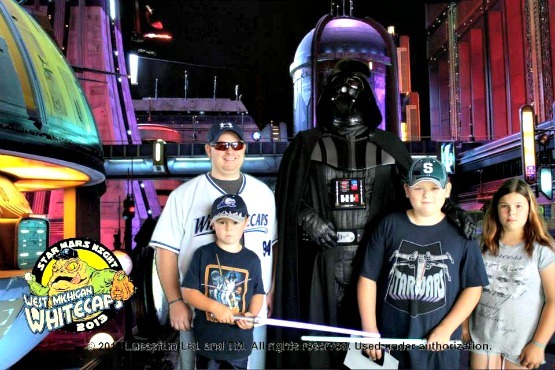 We were able to get pics with most of the characters on hand, especially Darth Vader and Boba Fett, who is simply the greatest. 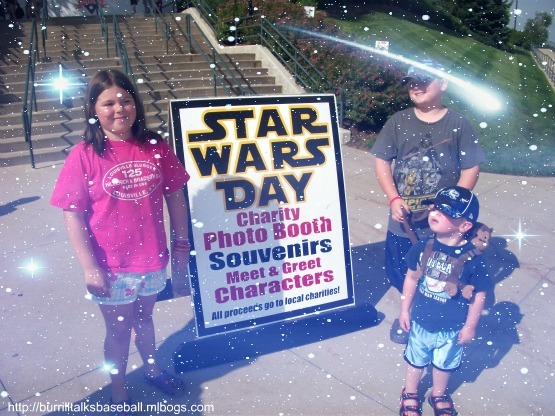 There were some Jedi and X-Wing pilots hanging around, but the kids, especially Trevor, favor the Empire and thier legions of Stormtroopers, Snowtroopers, and pilots. 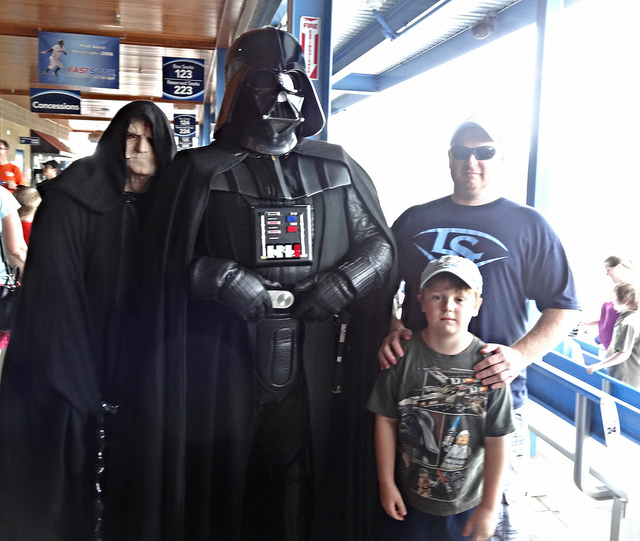 Brian wanted no part of Darth Vader, either, as you’ll see he’s not in the picture with him. 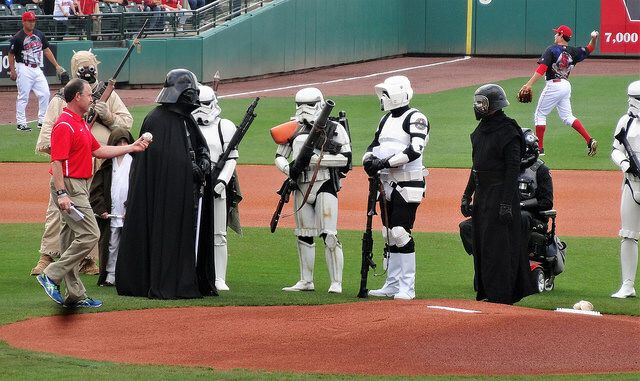 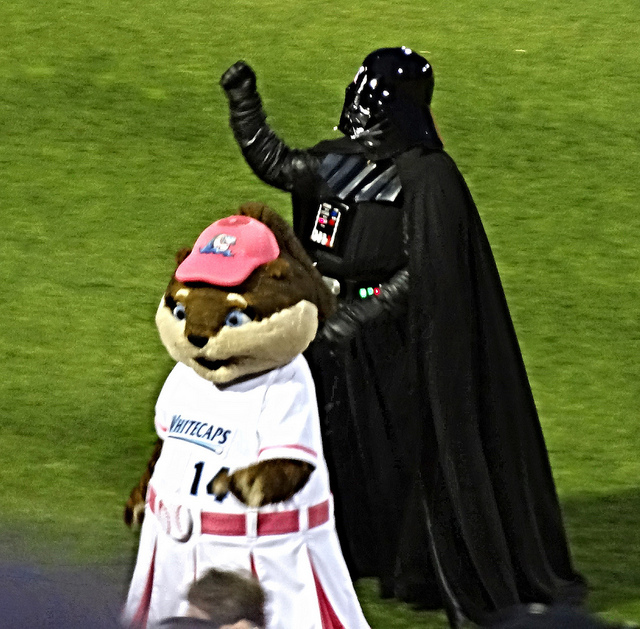 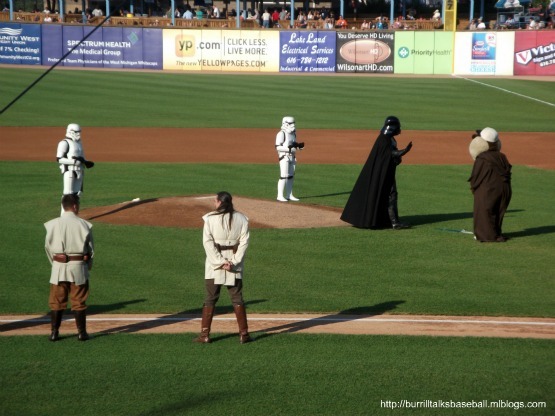 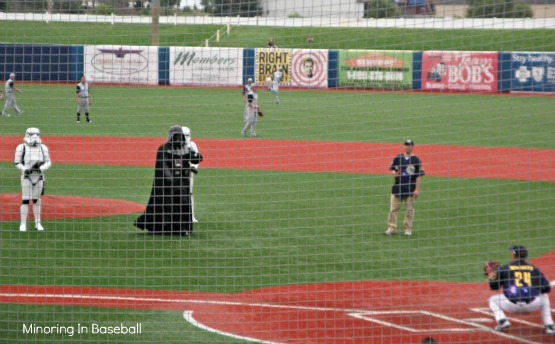 Darth Vader also threw out the first pitch, and had a little duel with Crash, the mascot. 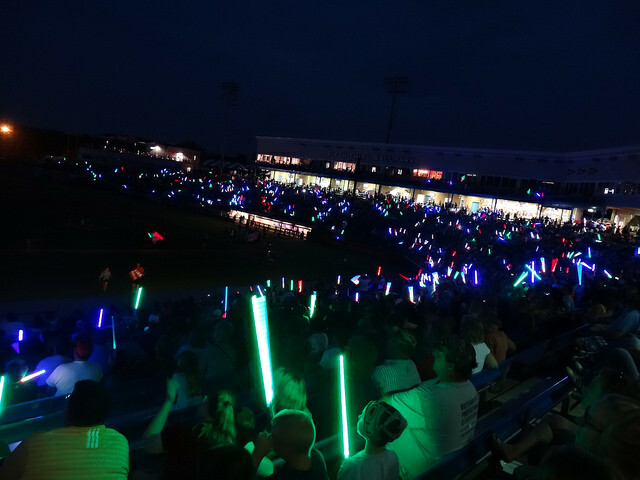 The night ended with a fireworks display with Star Wars theme music. 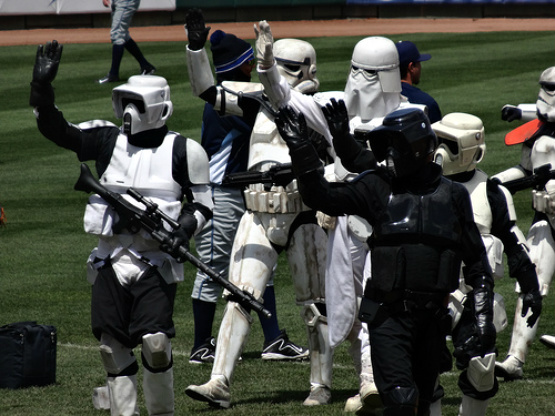 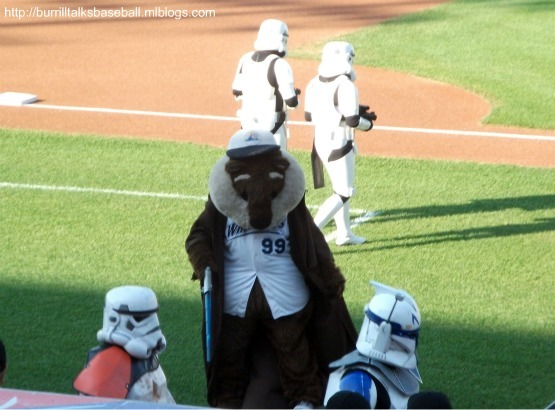 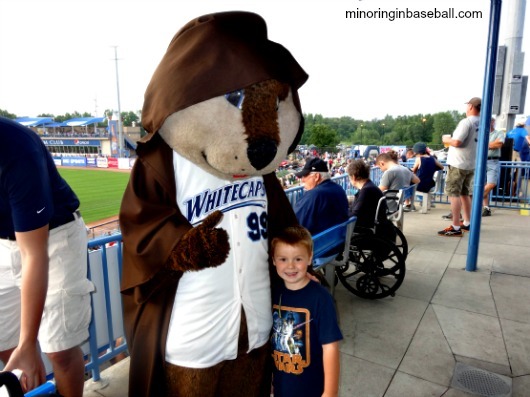 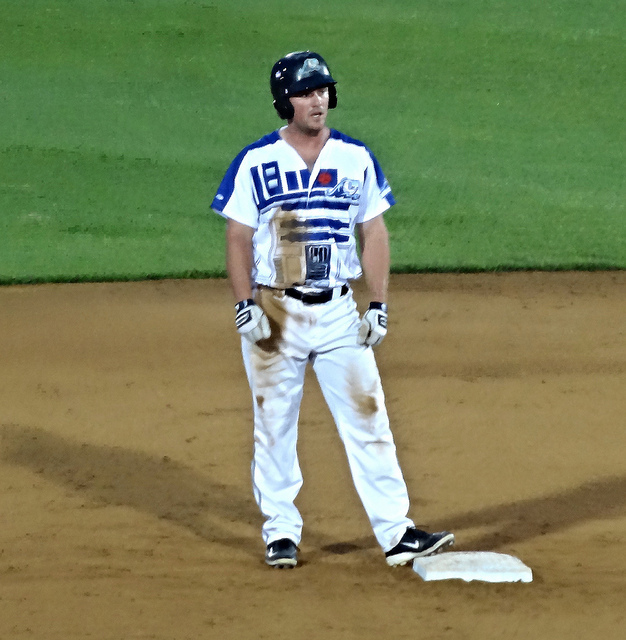 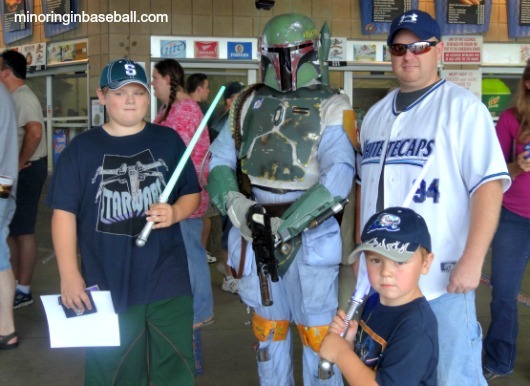 The Whitecaps also wore special Star Wars jerseys. 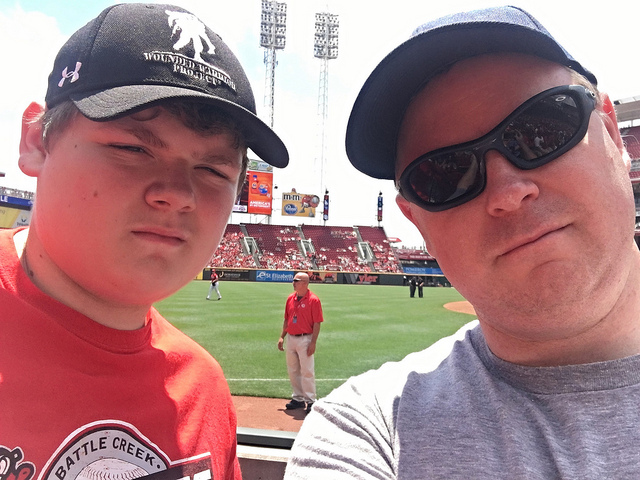 Of all the game I’ve been to so far, I think we’ve only seen the regular ‘Caps jersey’s once! 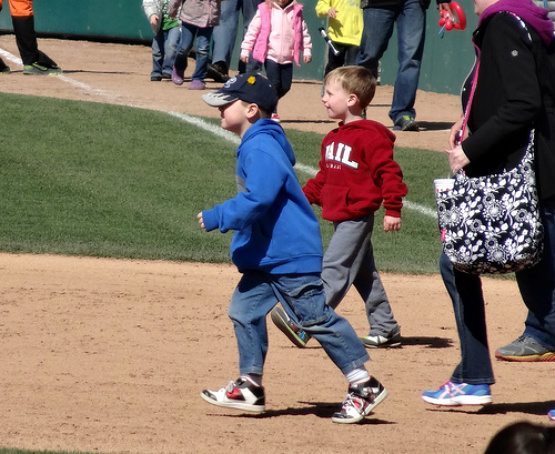 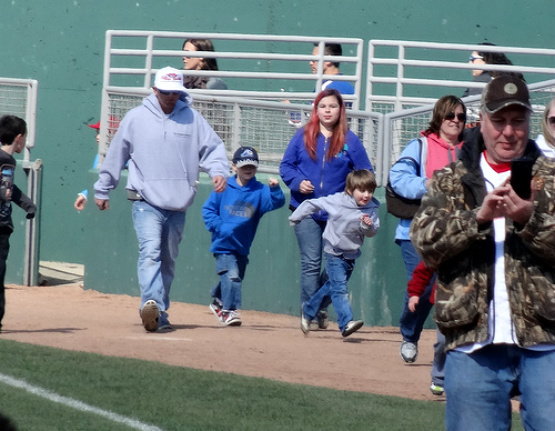 There was a huge crowd again this year, season high 10,528, but we still got to see who we wanted and had time to play in the park there, too. 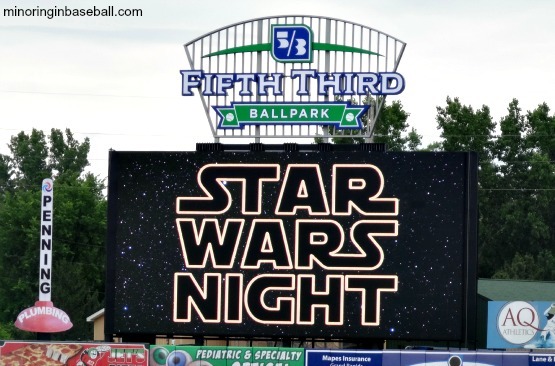 I’m not sure what our next game will be, but it will be hard to beat this night. 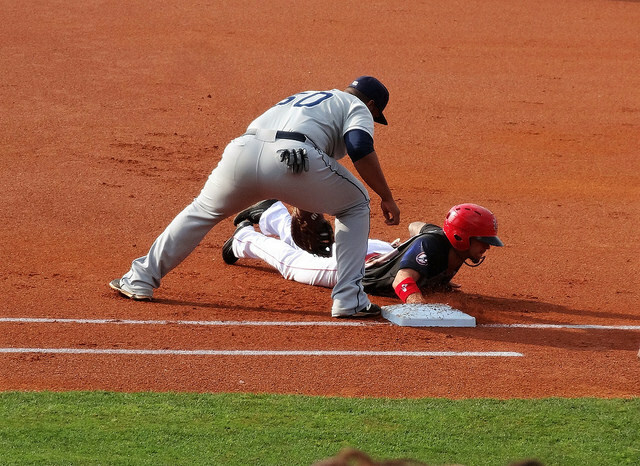 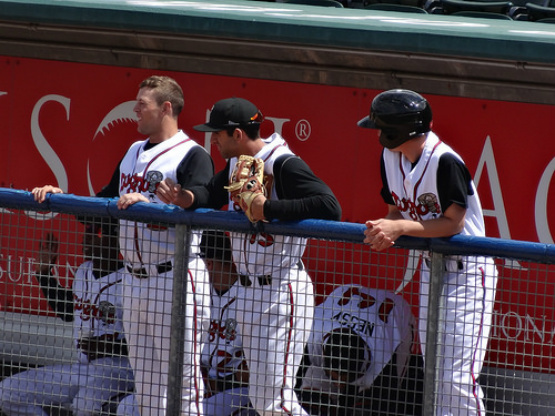 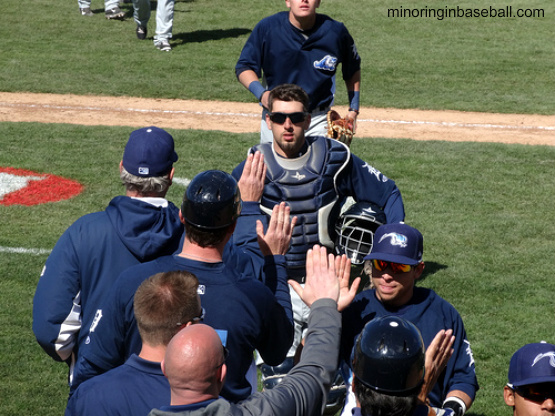 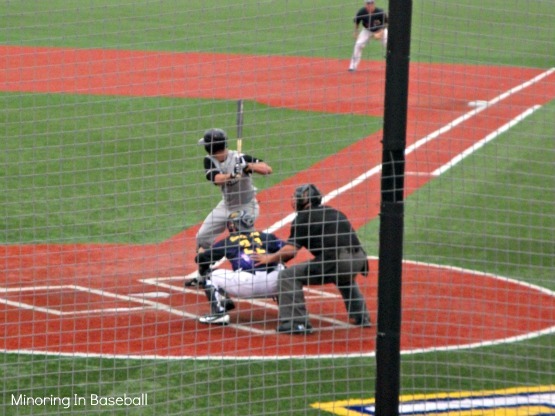 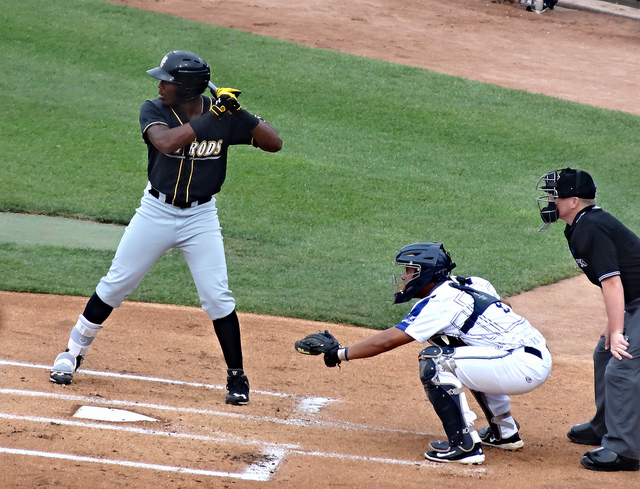 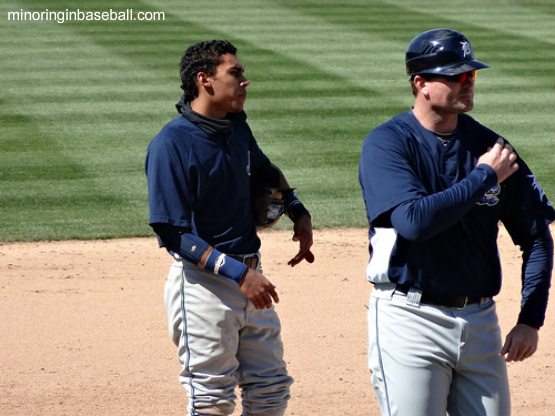 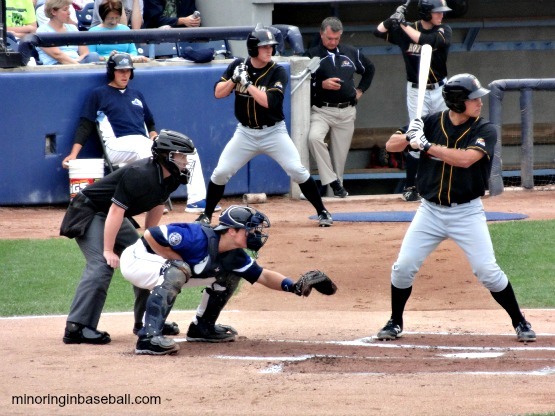 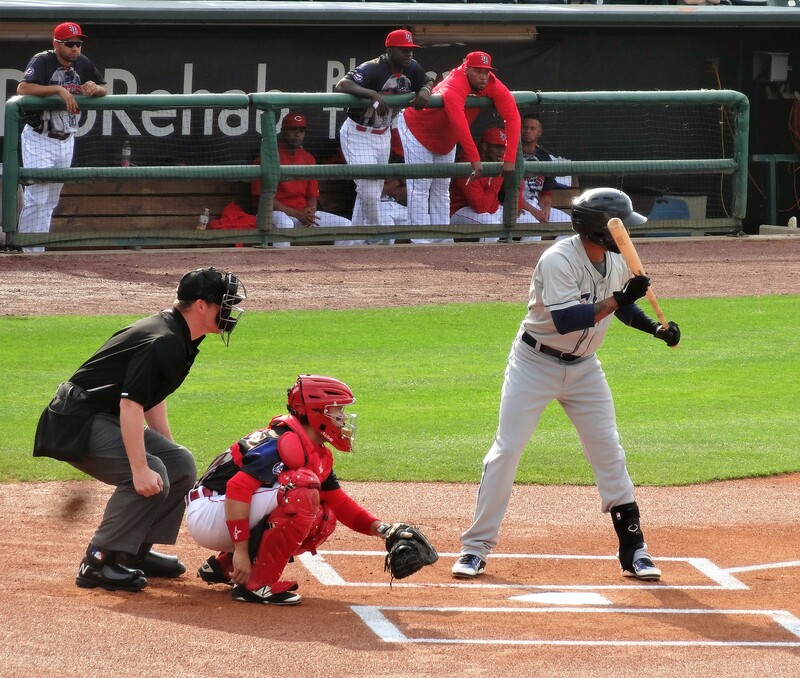 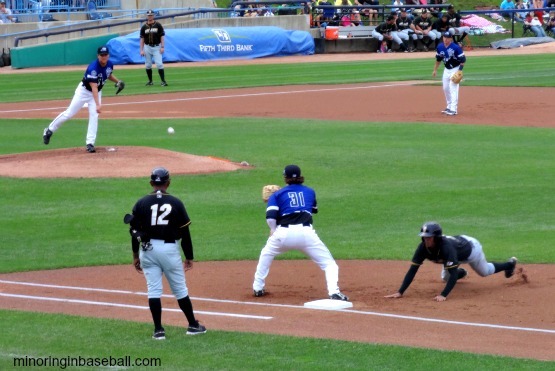 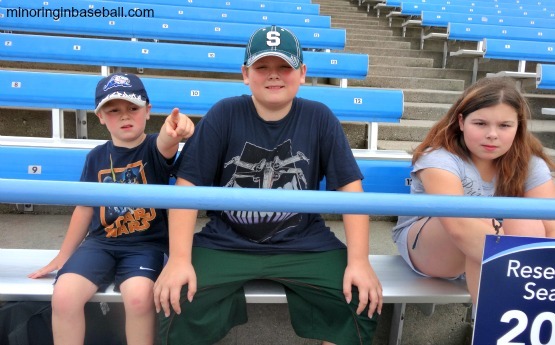 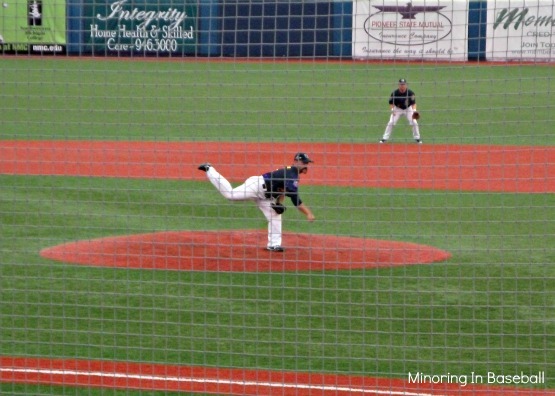 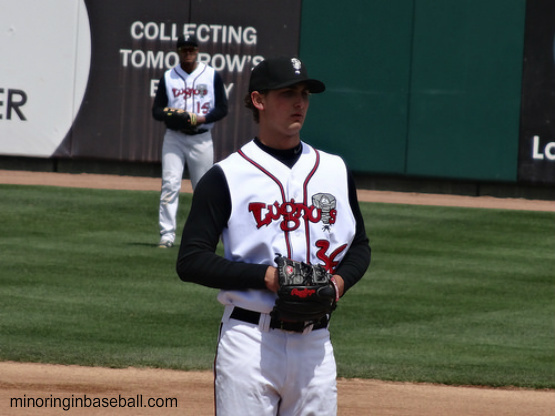 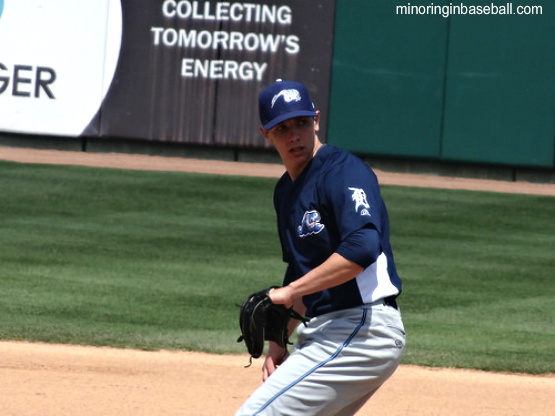 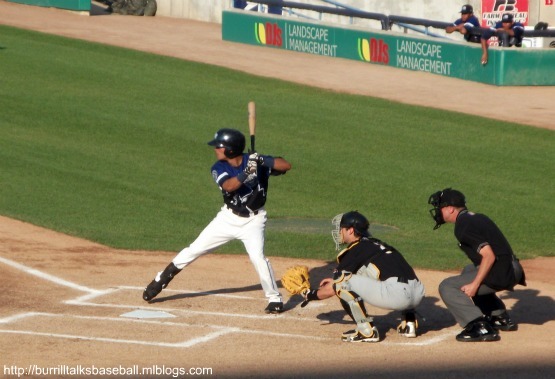 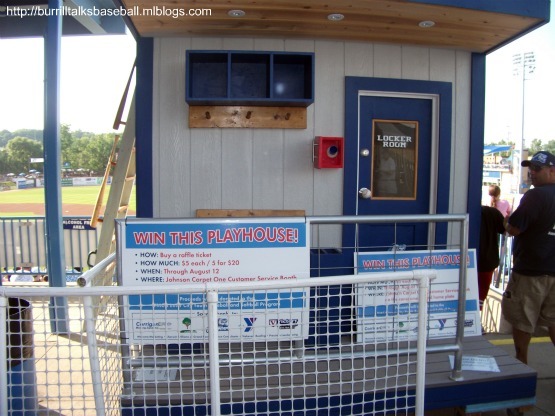 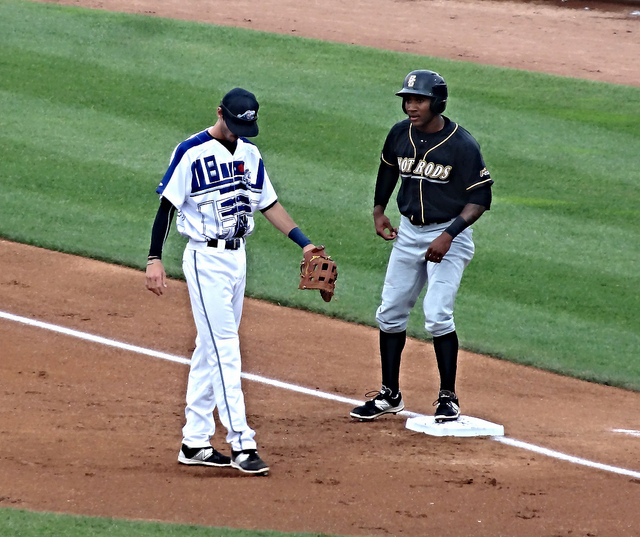 In the game, the Whitecaps had a solid offensive effort, beating the Hot Rods 11-3. 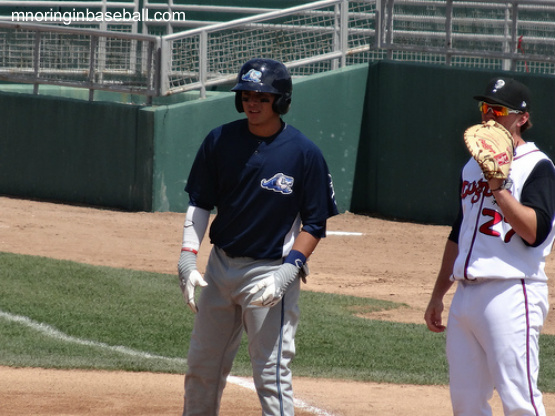 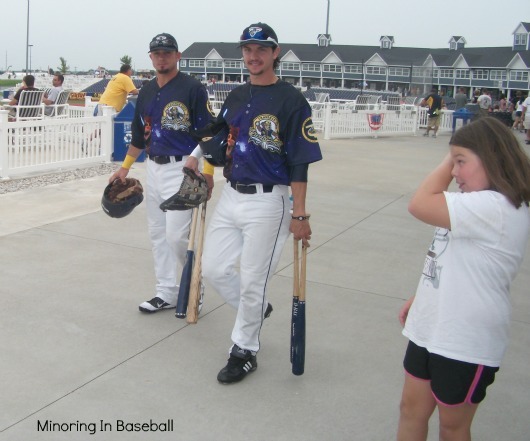 Top prospect Nick Constellanos had two home runs the game, and went 3-4. 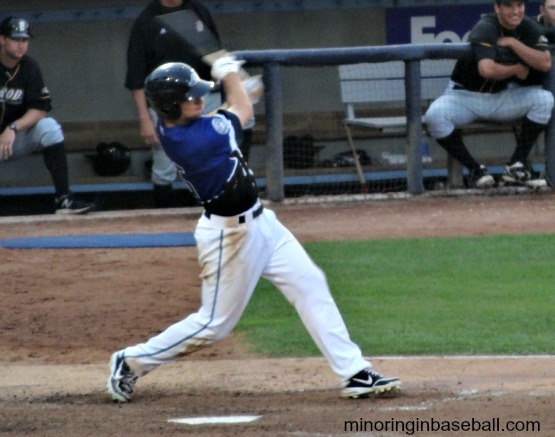 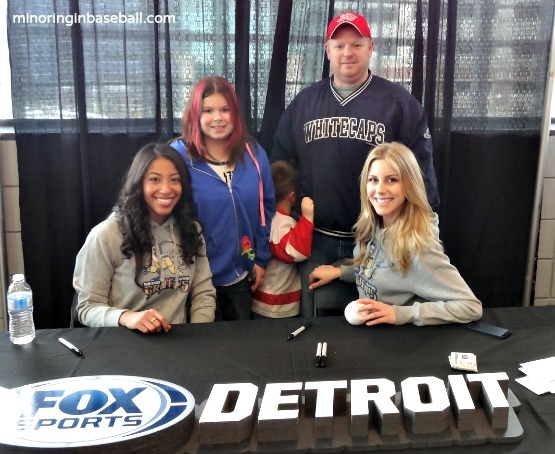 He was recently named the Detroit Tigers Minor Player of the Month for hitting .375 with 20 RBI’s in June. 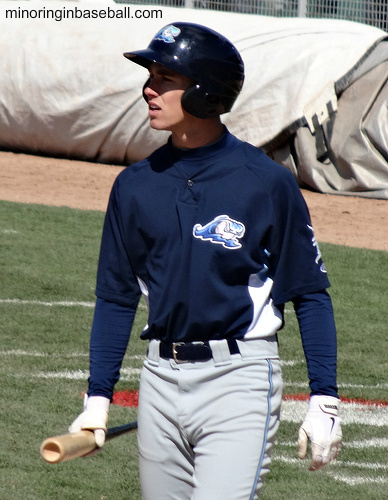 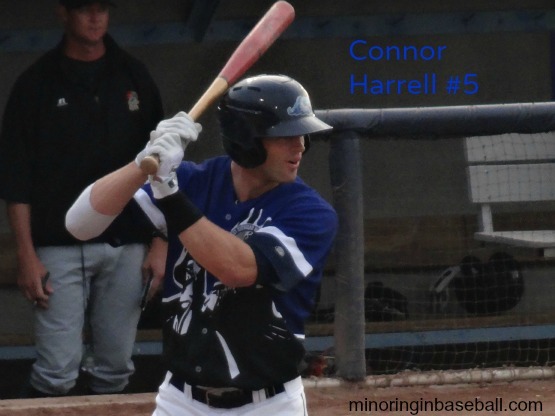 He now leads the Midwest League with 94 hits, leads the ‘Caps with 52 RBI’s, and is one of the MWL leaders in batting average with .306 and doubles with 23. 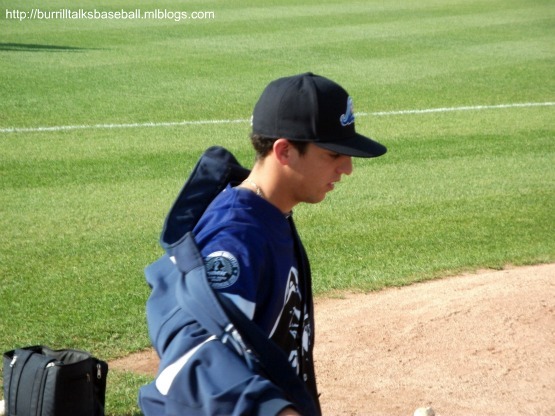 Castellanos is a good bet for next seasons Furtures Game if he keeps this pace up. 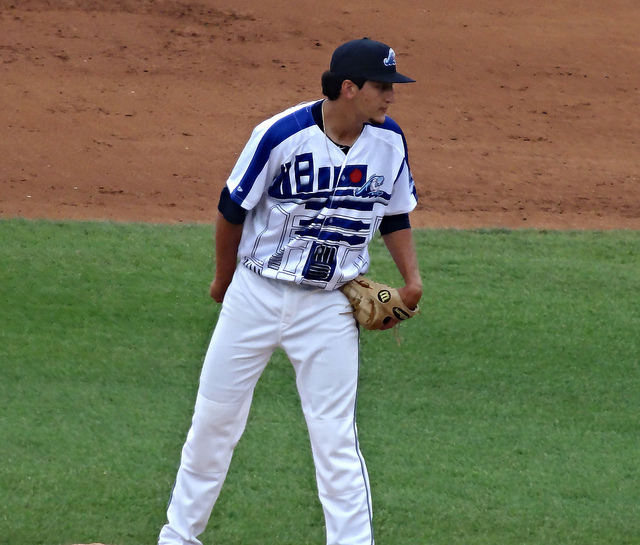 On the mound, Alex Burgos was solid in the win. 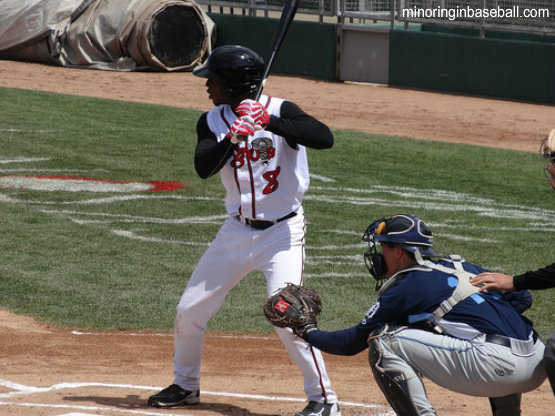 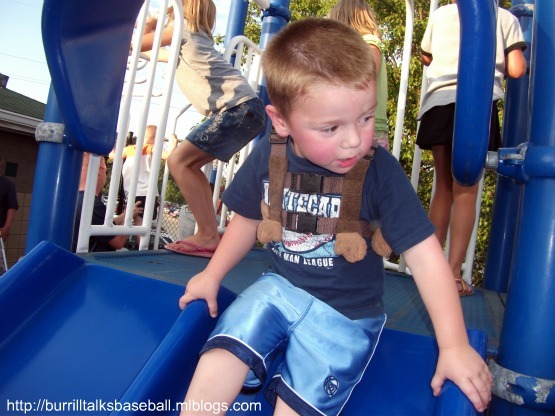 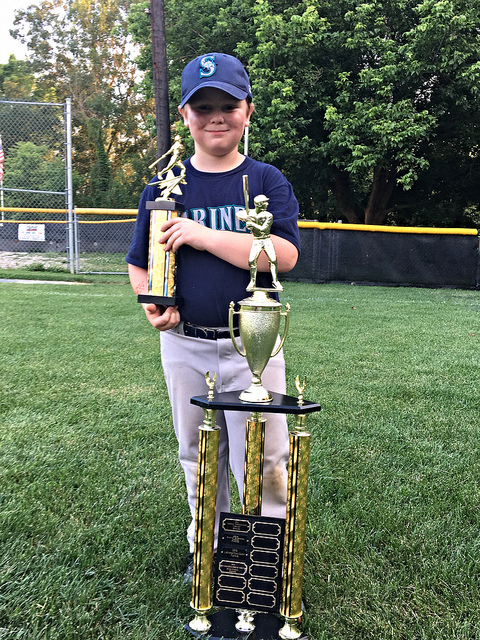 He allowed three runs on five hits while striking out six, to up his record to 4-1. 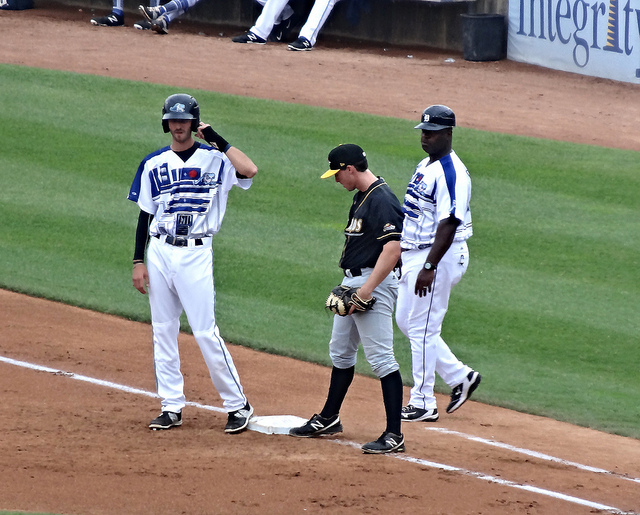 Three of the hits he gave up were infield singles. 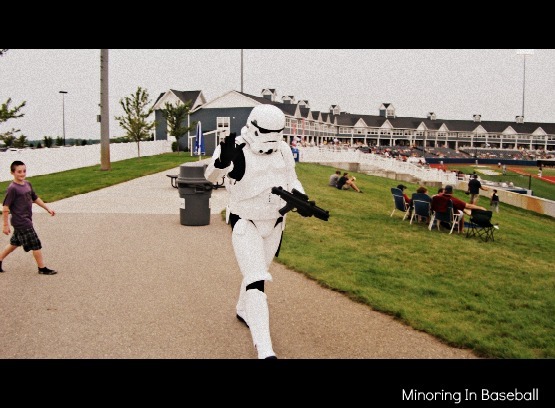 Aren’t they a little short for Stormtroopers? 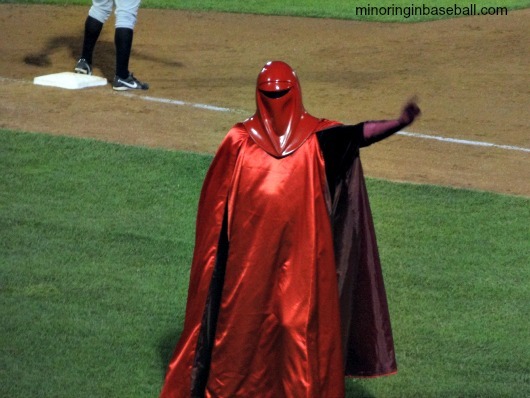 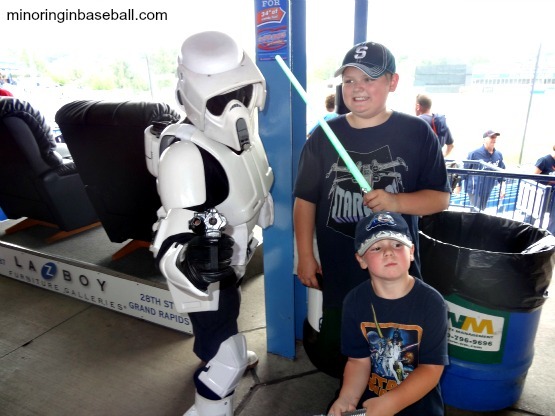 Star Wars Night-Episode I: No Phantom, just fun!!! 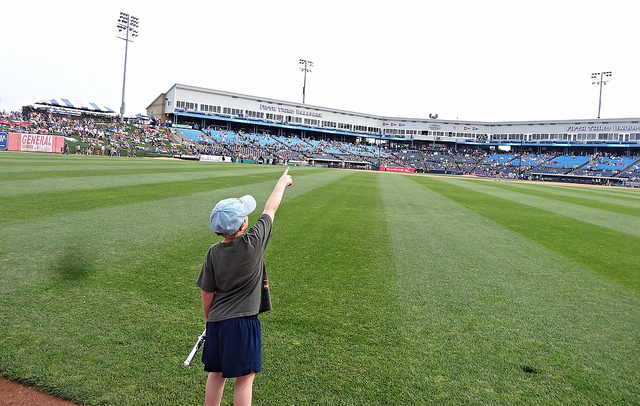 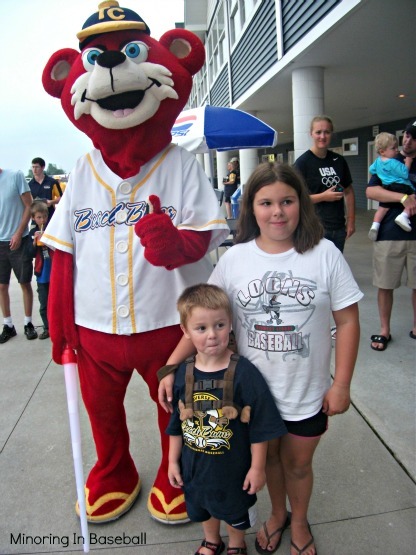 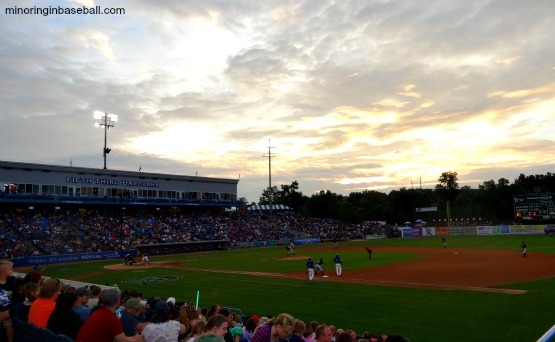 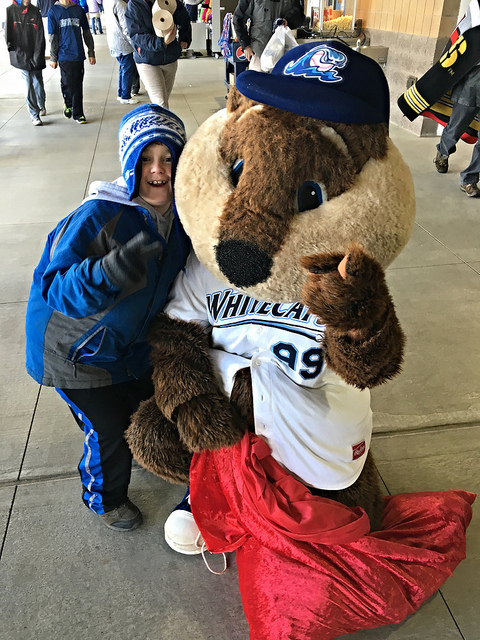 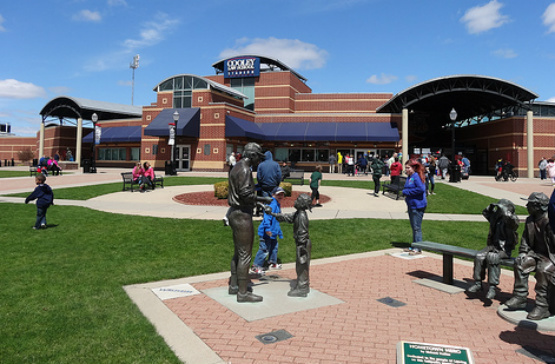 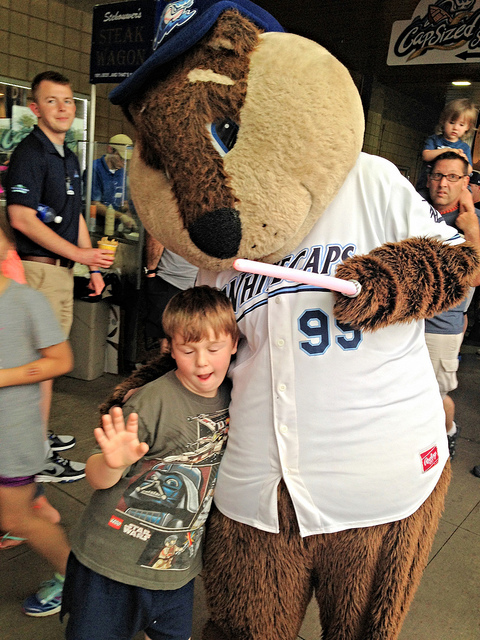 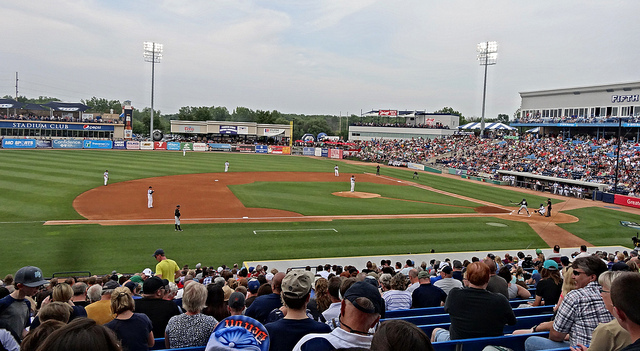 West Michigan Whitecaps vs. Beloit Snappers: As we were rained out last night, the weather was on our side tonight. 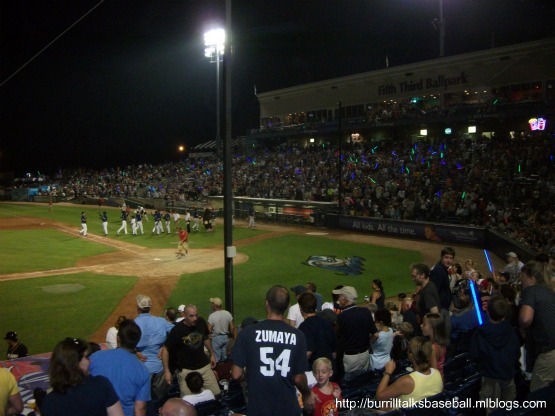 A beautifull night in Grand Rapids, to enjoy some baseaball. 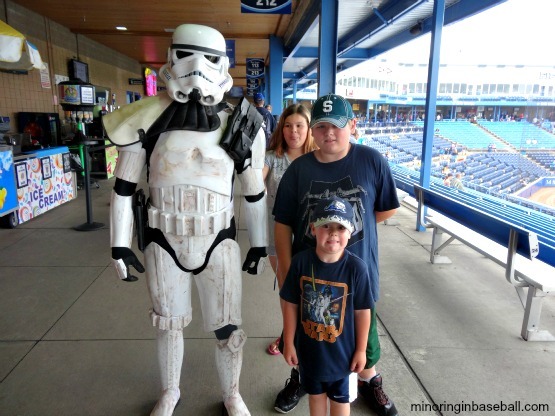 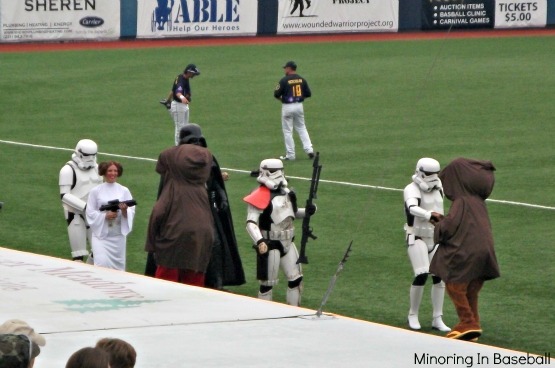 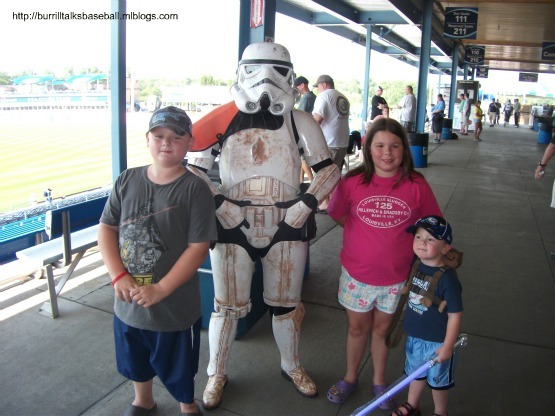 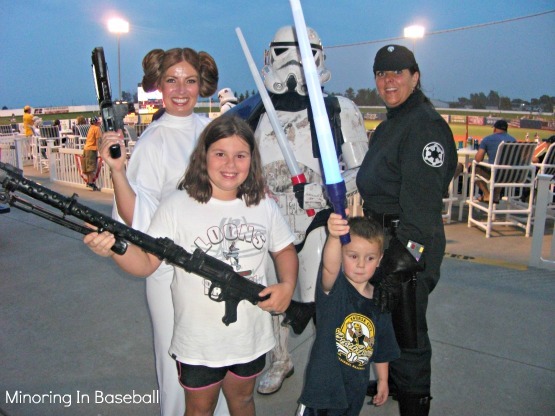 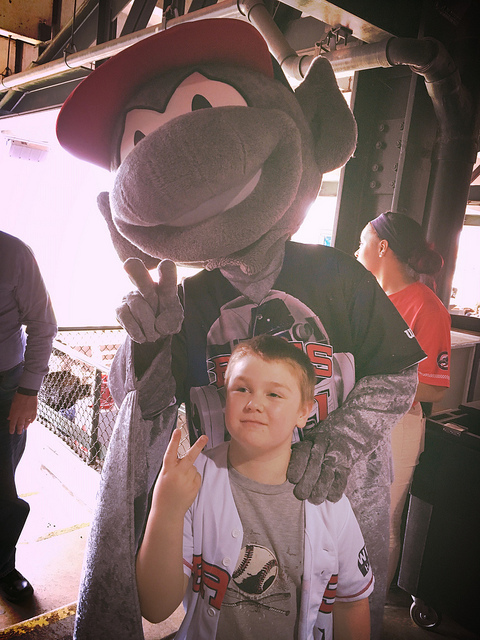 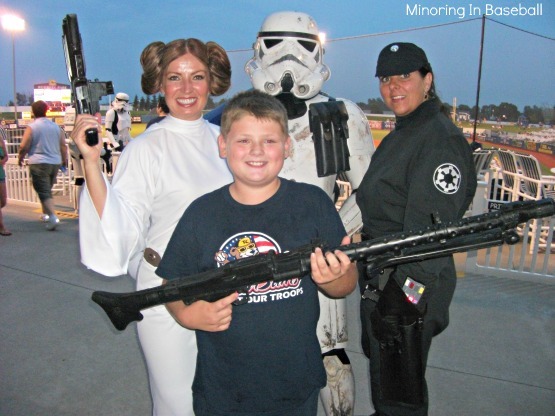 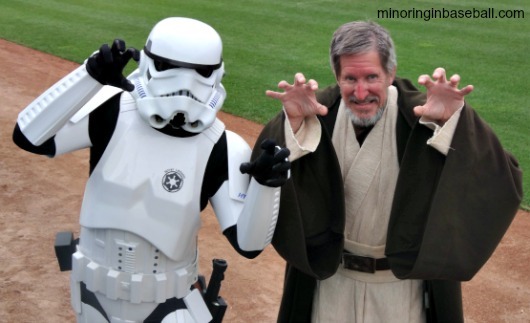 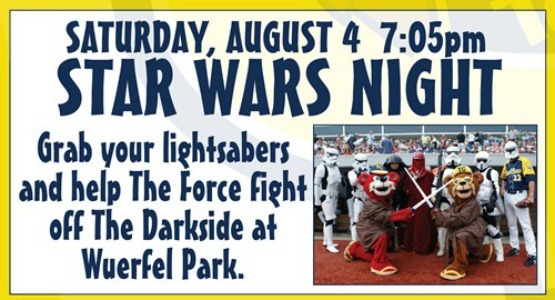 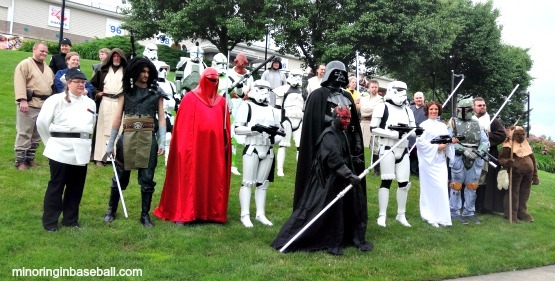 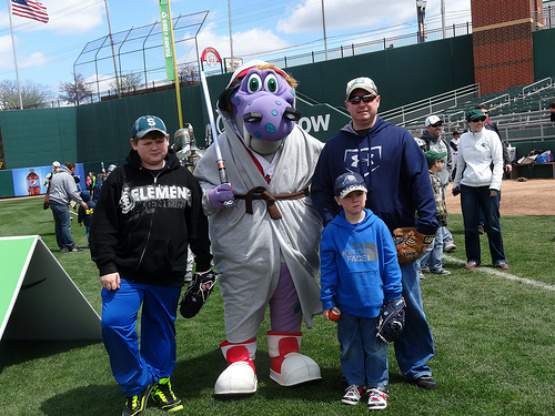 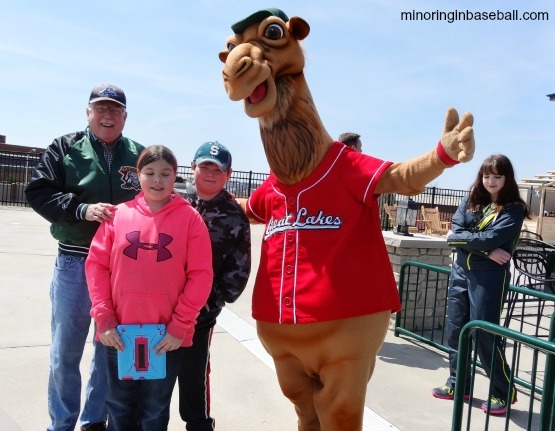 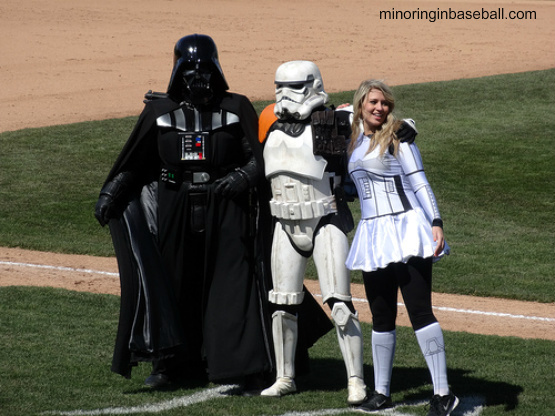 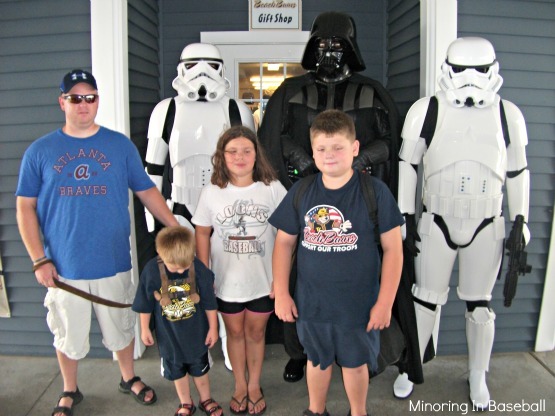 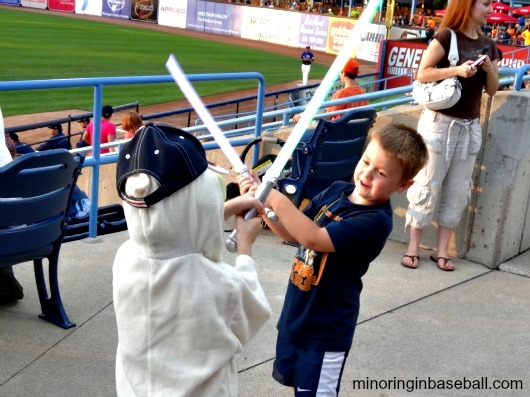 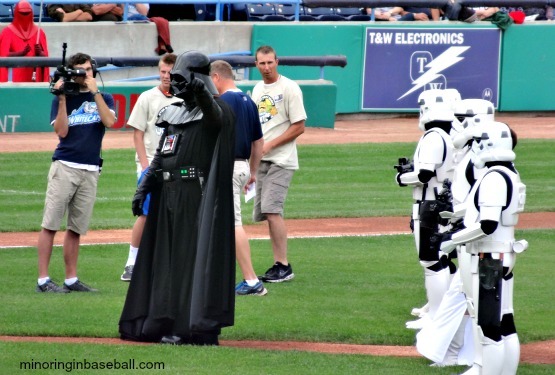 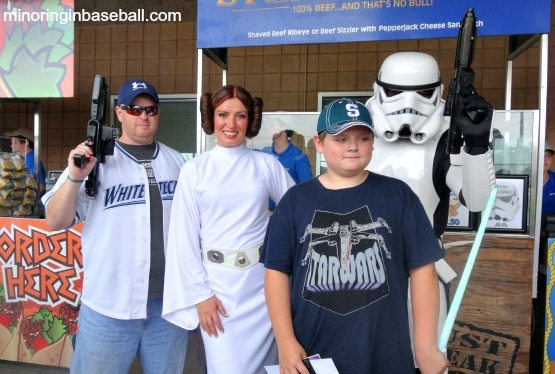 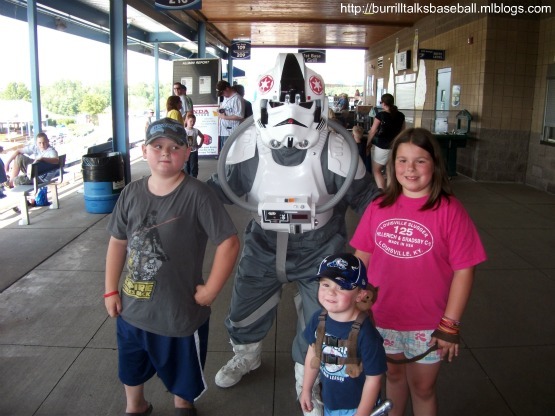 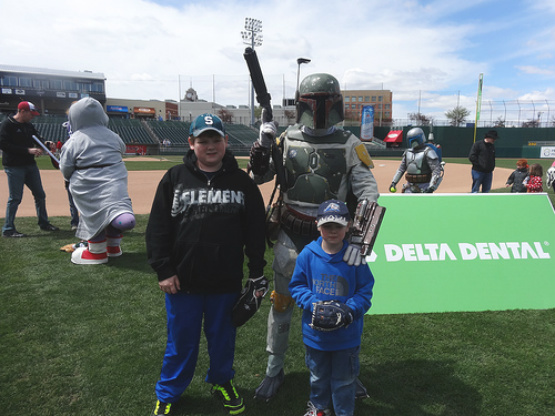 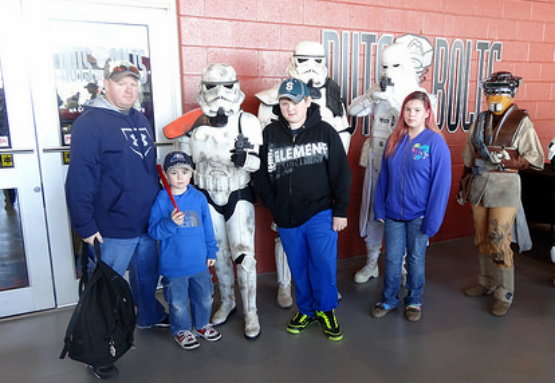 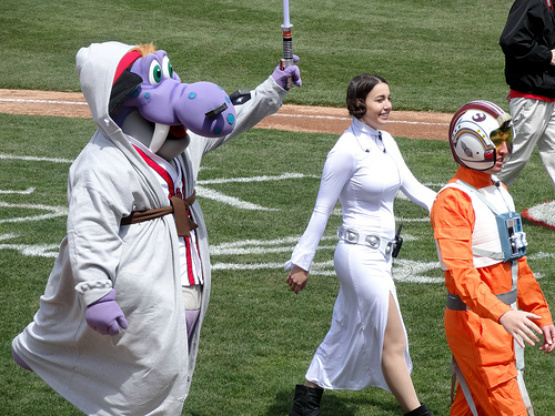 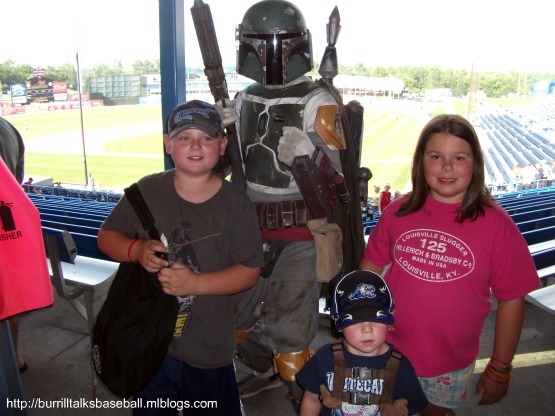 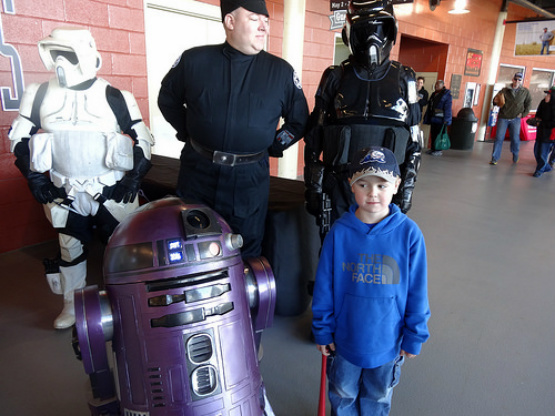 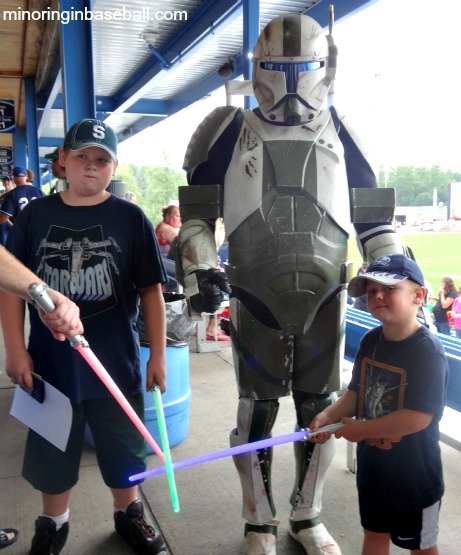 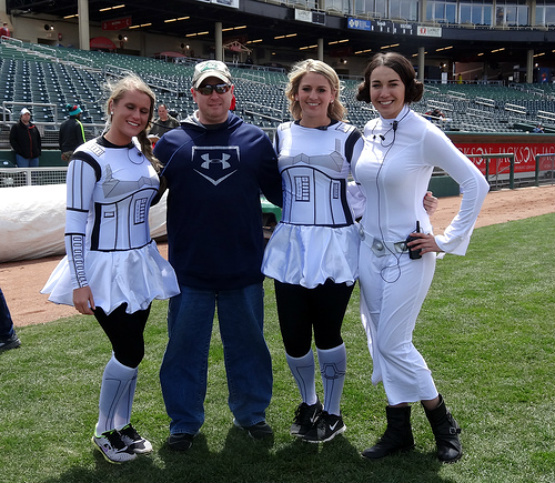 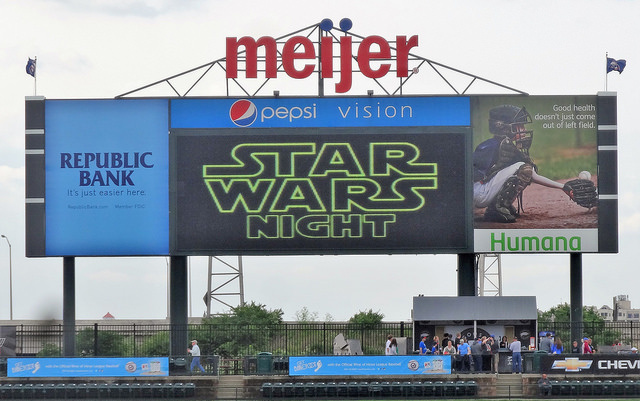 Of course, Star Wars night brought out over 10,000 fans to Fifth Third Ballpark for the game and to see their favorite characters. 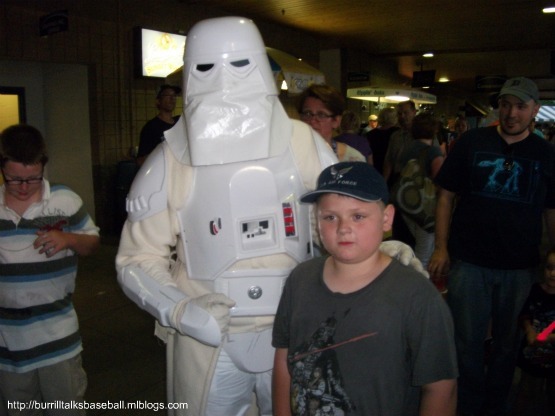 Yes, the two loves of my childhood colided in one special night with my kids. 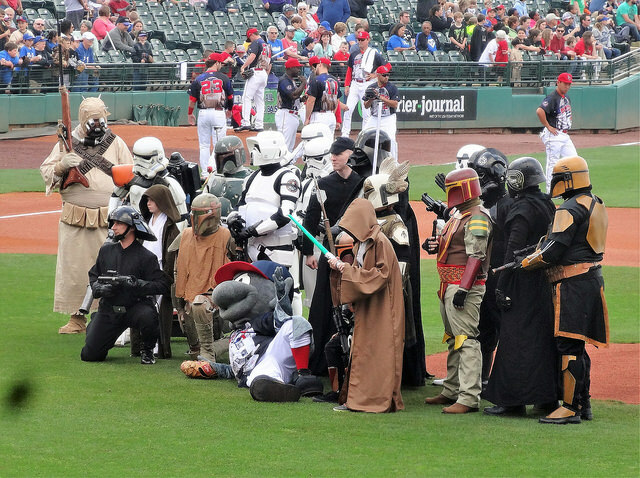 Baseball fans and Star Wars nerds fans alike were cheering in unison. 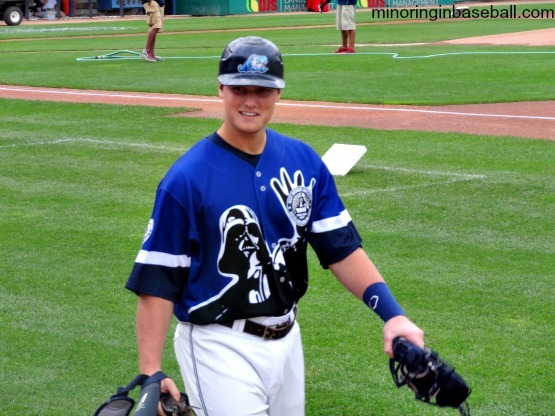 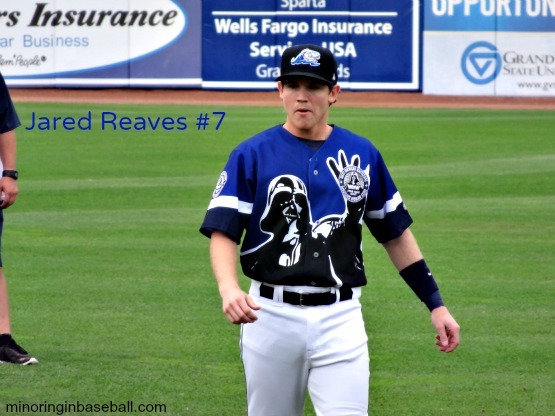 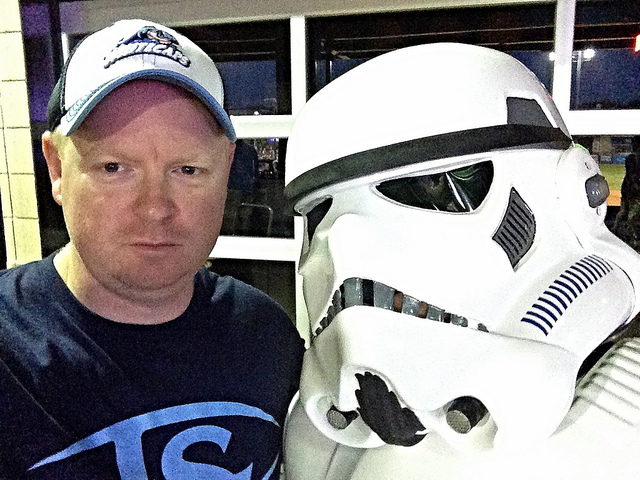 The Whitecaps even wore special Star Wars jerseys with the likeness of Darth Vader on them. 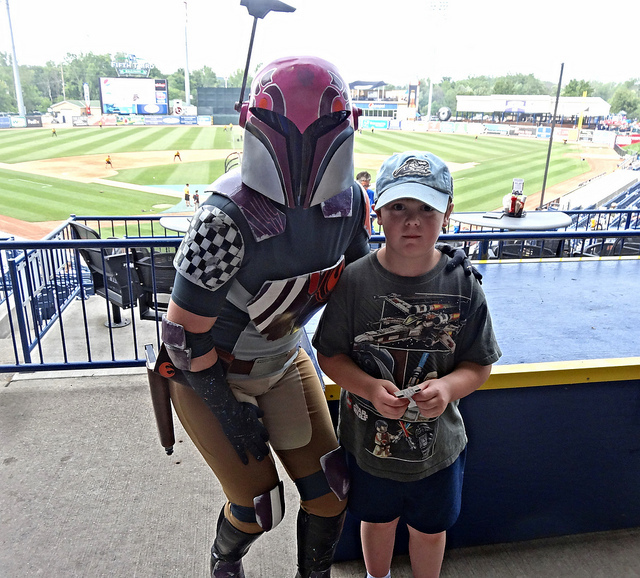 I think that Lily and Trevor were more excited over meeting the characters than the game, but at least they got to see everyone they wanted. 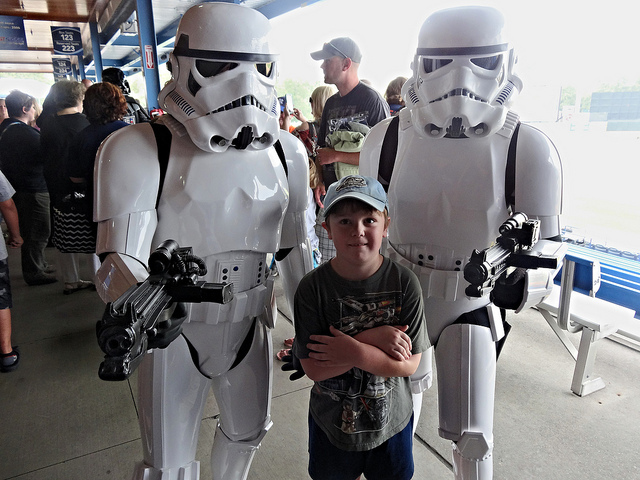 Trevor’s favoites are the Stormtroopers and Lily liked meeting Chewbacca. 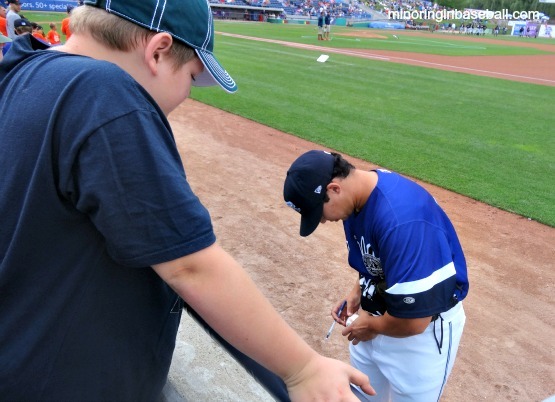 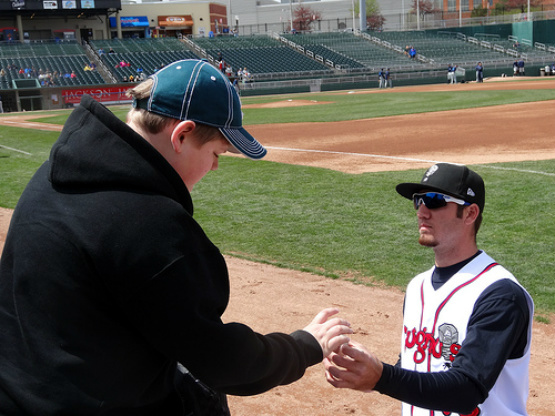 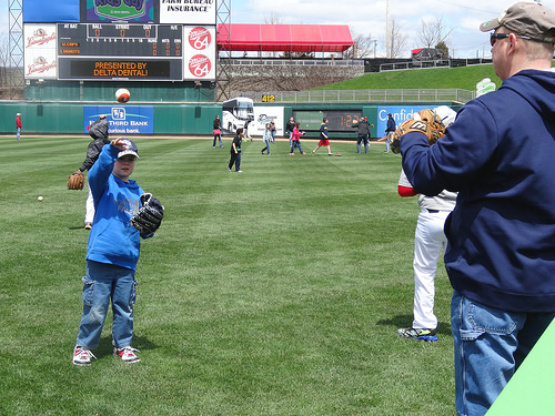 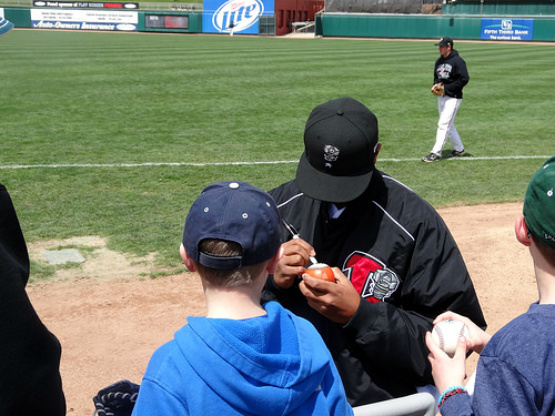 The kids also got autographs from some of the Whitecaps players like third baseman Wade Gaynor and hitting coach Louis Quinnones who played with the Giants, Reds, and Cubs. 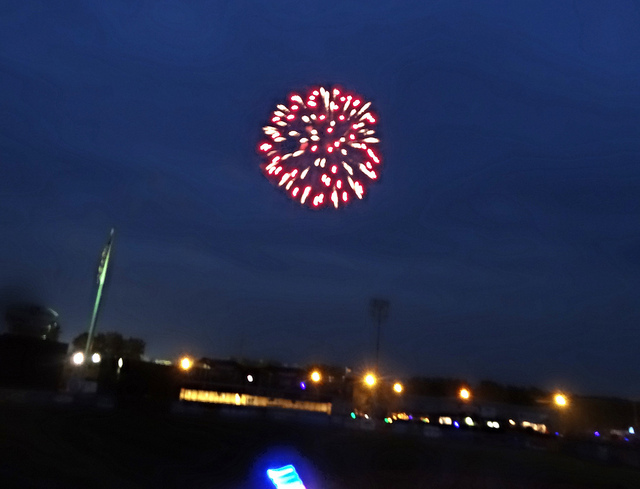 The game was capped off with a fireworks display. 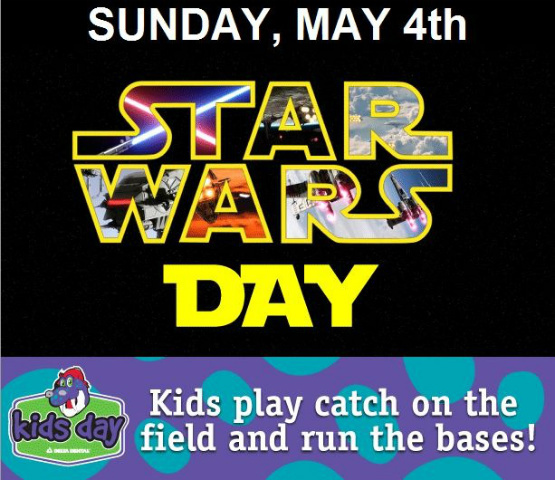 Of course the kids had to watch the Star Wars movies on the way home (no prequals), and are now hounding me to play with my 30 year old toys. 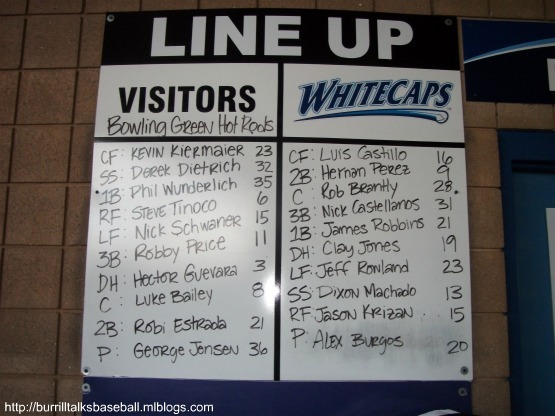 Oh well, they can’t last forever, but the memories of this ballgame can. 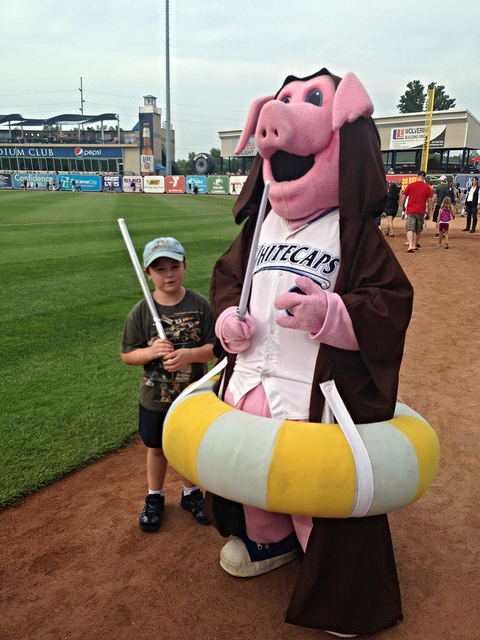 Final: Whitecaps 4, Snappers 6.